HOPE ALL MY CUSTOMERS AND READERS/FRIENDS ARE HAVING A GREAT THANKSGIVING AND MAYBE EVEN WORKING IN A FISH MEAL ALONG WITH THOSE GREAT TURKEY DINNERS. I guided for Dave Spaid for three days catching limits of walleye two out of the three days and then took repeat customer Troy Swift and crew out for real limited results in freezing rain and blowing winds. Minnows jigs or minnows bttm bouncer rigs and pulling plugs are now the baits. For all but the real hardy it is that time of the year for the fishing/guiding season to come to and end. My boat is going in for oil/filter changes and then it will find it's winter home. It has been a great season filled with lots of repeat customers (friends) and lots of fish. You can scroll back on my website under the 2017 reports/pictures and see the results. A bigger reliance on Lake Sharpe this year was in the cards as Oahe was spotty most of the year however things change sometimes faster than expected so maybe we will see more action on the big lake next year. I will continue to make a few posts over the winter months especially if any new news or changes take place. I will mention that the pheasant hunting season on public lands has not been as productive this year in many area's due to the drought conditions. Most of the guided private hunting ranches are shooting limits of birds so those that are coming to hunt on private land are going home with plenty of birds. I would like to thank all of my repeat customers and my new customers for your business this year and for many of you lots of years. This will be my last fishing report of this season but I will be glad to help out with information that I know about for any of you that are coming up yet this year. If you send me an email at fishinghutch@aol.com I will respond with any new info that I hear about. 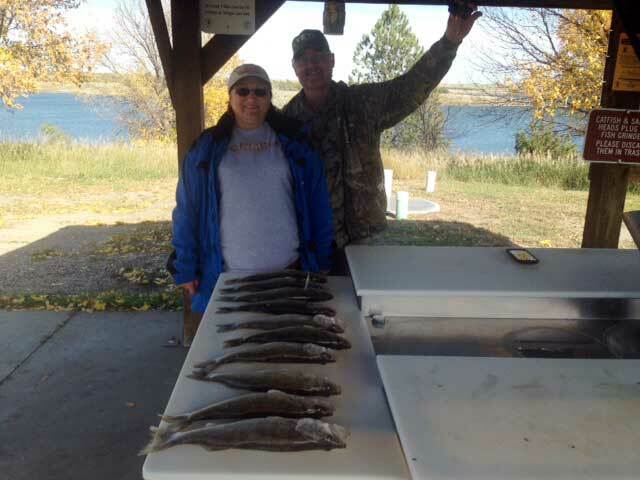 Fall fishing on Sharpe generally has been very good on days conditions are right but still is spotty on Oahe. This has put more pressure on Sharpe so if your concern is not to fish around other boats Oahe still is the choice however the bite is tougher. 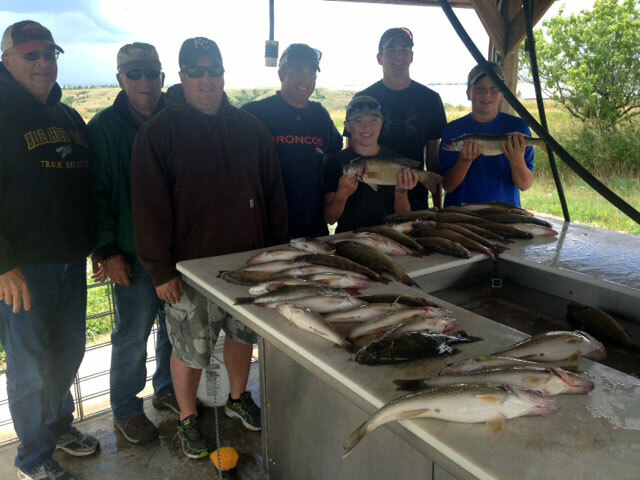 I guided a nice bunch of father/son grandson family the Hellers to a real nice bunch of walleye on Sharpe but limited action on Oahe and also a not so nice weather day with rain/wind all day. Great family. Then went on to guide along with Scott Van Lierre and Ne. John another of my favorite groups of guys from around the Gillette Wy. area ramrodded by Greg Greenough. 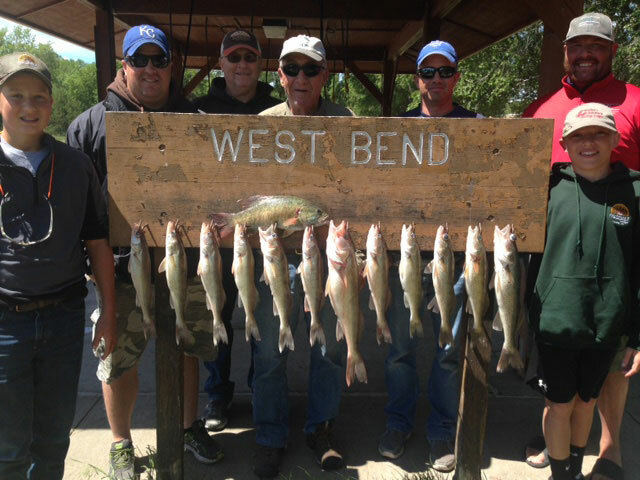 I have had some really great trips with this bunch and this one was no exception as we got them full possession limits of walleye along with a nice fish fry cooked up by the Ramkota in Pierre. We caught the walleye on minnow/bouncer or minnow jigs in around 10 fow. Nightcrawlers are now on the way out. They all come over annually to hunt pheasant's but come early to fish before the season opener and boy do they have fun. They always go back with limits of walleye and birds and I am sure this year will not be an exception. Weather is FALL so watch it and try and plan it in last minute trips if possible PHEASANT SEASON OPENER THIS WEEK END. A lot of Orange around town. 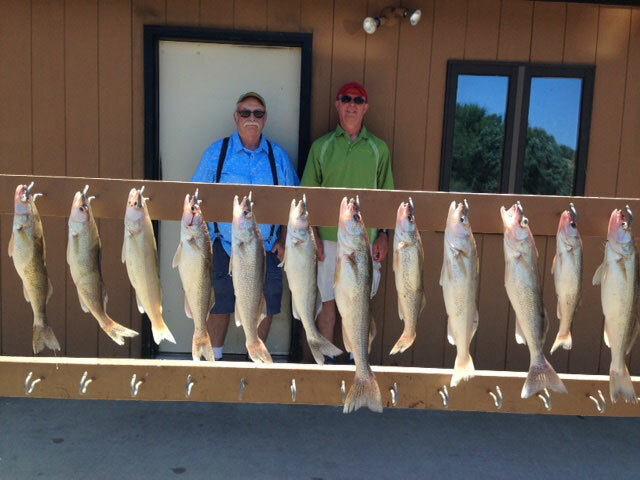 I guided Les Johnson from Rapid City and his friend from Germany to full possession limits of walleye some catfish/bass and northern pike for a real enjoyable trip with real nice repeat customers. 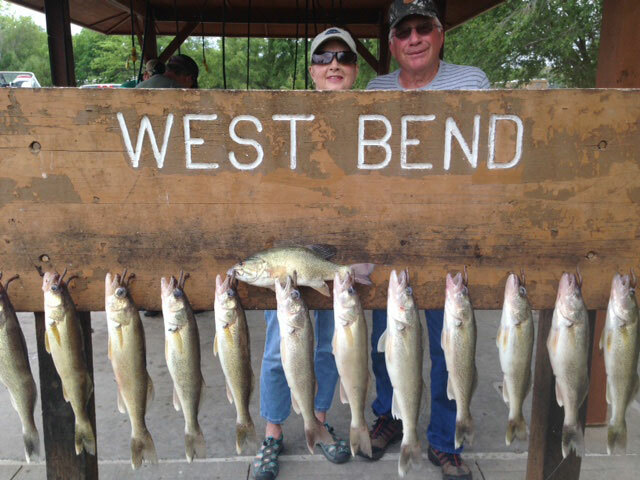 They also had plenty of walleye so enjoyed fish for supper while here. We caught the walleye on Sharpe in around 10 fow on both nightcrawler or minnow/bouncer rigs. Then caught the bass/northern on Oahe in around 30 fow on the same rigs. The bite on Oahe is still spotty needing colder water temps to get the fish in stable water depths as right now they are in a lot of different depths. One real nice thing about Oahe is very little boat traffic. We never saw another boat all day. Sharpe is just the opposite with lots of fishermen in the main bite areas. I am looking for jig/minnow fishing to be the bait of choice very soon as water temps fall. Weather has been nice but this time of the year keep your fingers crossed if coming over because changes occur regularly. Bringing fall clothing along is a very good idea. The morning boat rides this week were snappy. I spent the last week fishing down on Sharpe fishing nightcrawler/bouncer rigs in around 10 fow out to 17 fow. 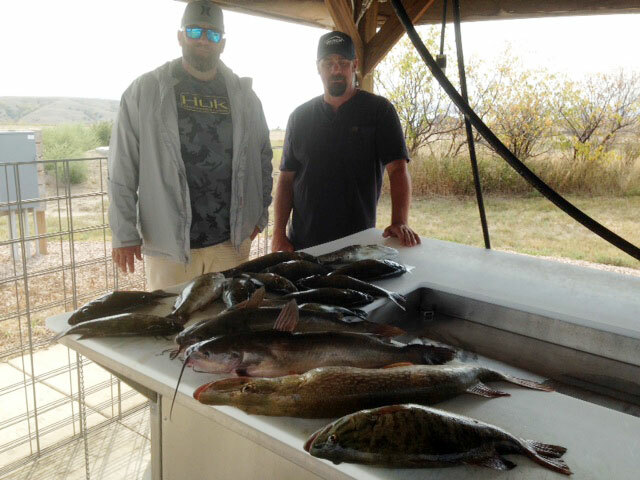 We caught limits of fish most days but had a few days that were not as good. Some due to wind/weather but over all the bite remains about the same with fish biting when the weather /current are favorable. 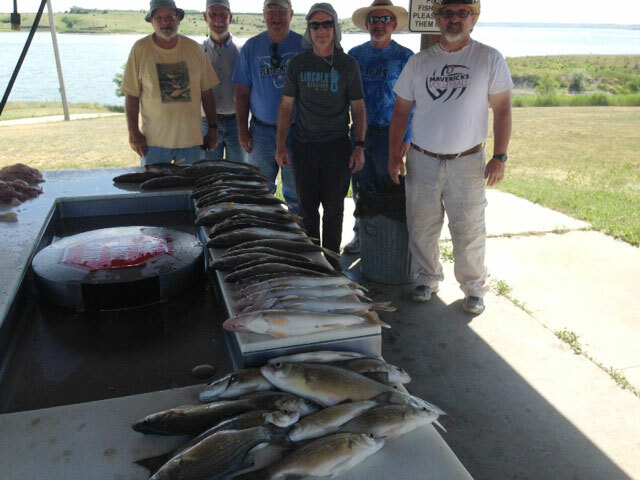 I guided Rev Tom Christopherson and his two boys along with friend to full limits day one but struggled some in a lot of wind on Sharpe and also Oahe. 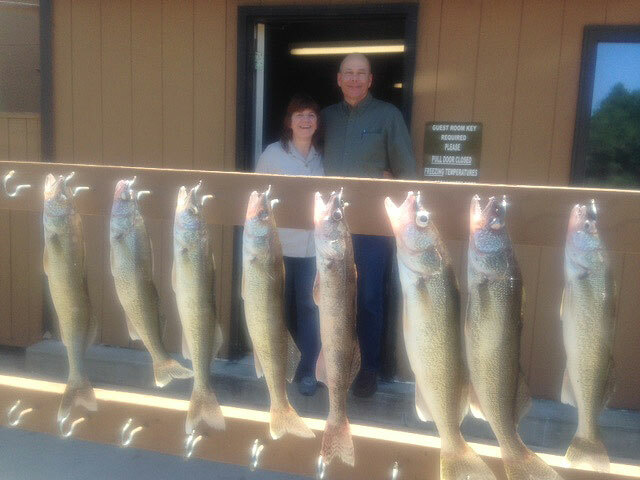 Then took Jed and Mary Piles from Malcom Ne Out on Sharpe for full limits and possession limits along with a big meal of walleye while here. These two are long time repeat customers and just as fun to guide and fish with as any repeats I have. We have had many great trips over the years and I always look forward to spending time with them. Oahe is spotty and I think for any fall bite to start we need some colder nights to get the water temps down and center the fish in more consistent depths. Fall is here so be prepared for weather to be a factor in all fishing trips. Warm clothing is starting to be an essential part of trips. 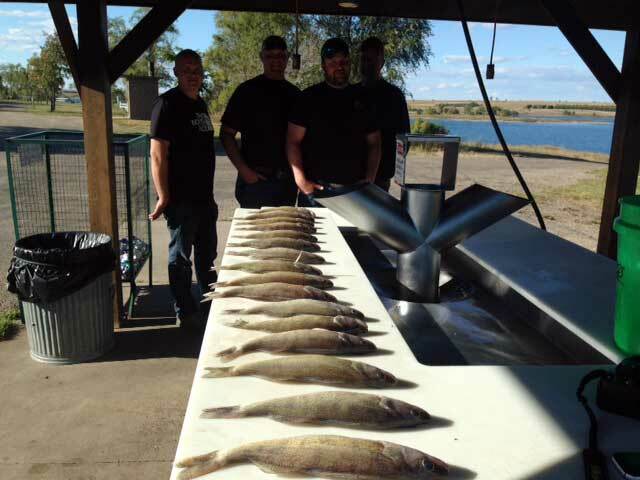 Not a lot has changed on Sharpe since the last report but parts of Oahe are starting to see walleye starting to look a little more like fall is coming. I along with six other guides spent one day on Oahe and one day on Sharpe fishing one of my best all time favorite repeat business groups Dow Ag being ramrodded by Marty and Emma. Most of these 22 guys were from Ne or Iowa and just as great a bunch of guys and Gal as I have for repeat company groups. Once again this is just a great way for company's to repay hard working employee's and speaks to the quality of a firm you work for. These guys all appreciate these fishing trips and I can assure you so do us guides and the resort owner. 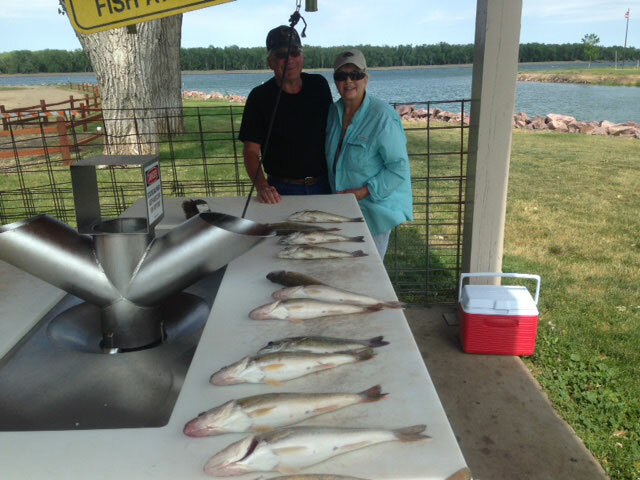 We took them all up on Oahe the first day with decent results for walleye with most boats averaging around 10 fish a boat along with some bass and northern as well as quite a few catfish. Not limits of walleye but close, and without seeing hardly any other boats. That is the nice part of fishing the big lake. We caught most of these fish from 17 fow all the way out to 40 fow with some even in the 10 fow depths so walleye are scattered all over keeping the bite harder. Cooler fall temps should start bringing them to consistent depths making for an easier bite. Most boats used nightcrawler/ bouncer rigs but some fish were caught on bouncer/ minnows. 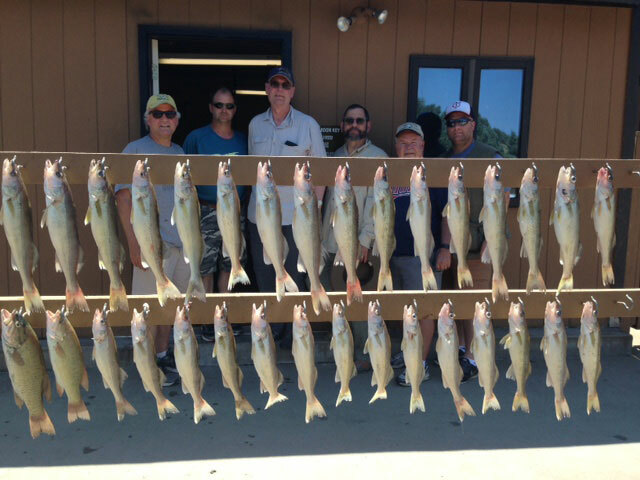 Then day two went down to Sharpe for what amounted to full limits of walleye over 15 inch's to a few over 20's. Probably right around a 16 inch average. 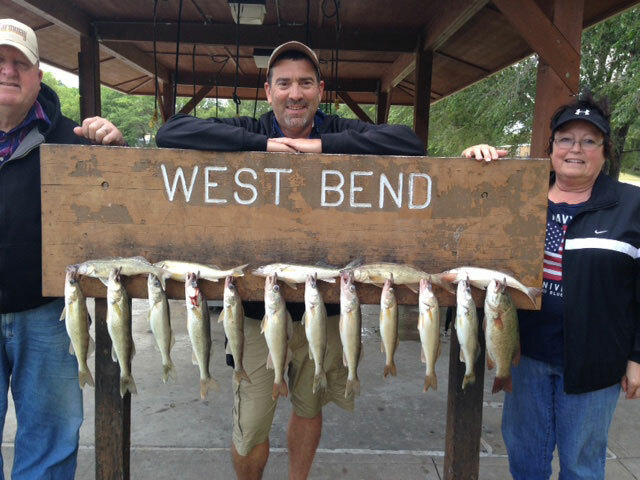 Caught these fish for the most part the same way with more boat traffic but in 10 fow avg. Nightcrawlers still seem to still get the edge but many baits/presentation work including pulling plugs. Trolling can be difficult in many areas because of floating weeds. Great bite on Sharpe when conditions are right but you can run into tougher bites if the water dirties up from to much wind or if the corps runs either not enough or to much current so there can be days that are much harder.Fall days are here so cross your finger's for those great days. The group above got real lucky with two great days and so did all of us guides. Its not always so nice so plan trips with warm clothes/raingear as part of the packing. As the fishing season will soon start to wind down I will be posting reports at more of a weekly rate unless something changes drastically. I guided the Jeremy Farris group for a two day trip and then went on to guide the Bob Staroska group of repeat customers from Ne and then did a trip for the Outpost Lodge and finished with a trip for one day with Tom Caldwell from Rapid.City. 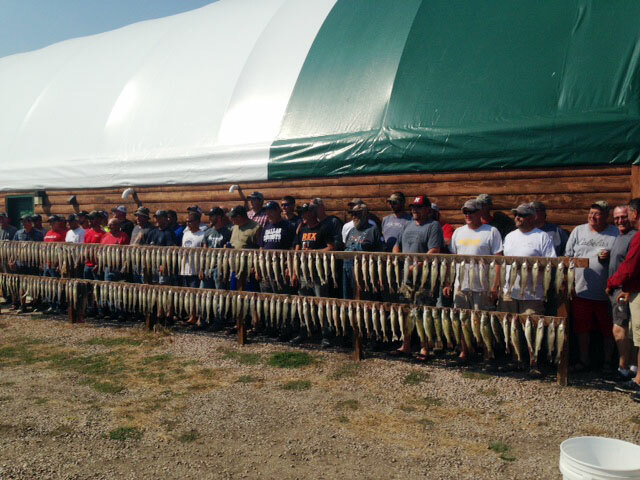 All of these trips produced walleye and Bass if we went after them. On Sharpe we are still catching the walleye on crawler bouncer presentations in 10 fow or less and on Sharpe the bass in 20 to 30 fow with walleye starting to come in but from depths of around 40 fow. Minnow/bouncer rigs is what we have been using on Oahe for the bass with nightcrawlers still best for walleye. Just a great bunch of customers with some days being tougher especially on Sharpe with the 15 inch slot limit. Fishing on Sharpe can be tough if we get a lot of wind muddying the water up. That along with not enough or two much current can slow the bite but if every thing is going right the bite can be excellent for eating size fish. As the nights start to cool bringing temps down look for a minnow/jig bite and hopefully a nice fall bite on both lakes. Everything now will have to do more with the weather so hope for those great fall days. I guided John Meinders and his work friend out for a day trip on Sharpe. A couple of great young men just out of military service. We all had a great time. 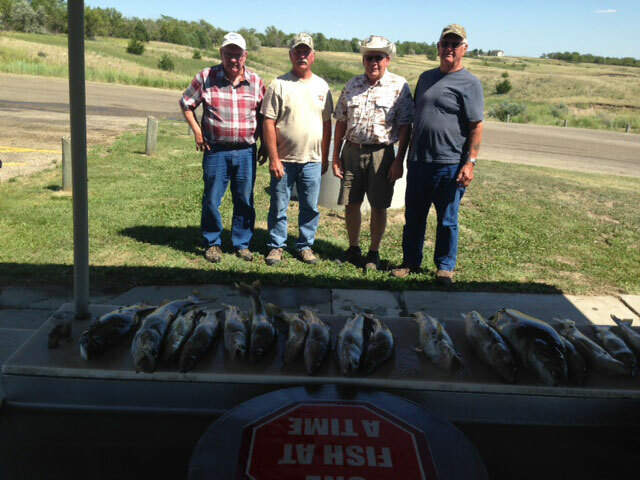 Then took Jay Lewis and friend from Rapid and Great Falls for a day on Sharpe and a day on Oahe. The first trip was great weather and limits went in the boat catching these walleye in around 10 fow mostly on crawler/bouncer rigs. Did the same in big wind the next day and did not catch limits but went on Oahe day two with the Montana guys and got full limits of smallmouth bass to 5 lbs. and a northern along with a couple of catfish using bouncer/minnow rigs in around 30 fow. Sharpe has lots of boats everywhere ( many driving 180 miles round trip from Chamberlain) but other than a few bass boats we never saw another boat all day long on Oahe. One other trailer at the boat ramp at Little Bend so if you just want to fish without a lot of traffic and catch smallmouth, northern and some catfish no doubt the big lake is a great choice. Walleye fishing however is much better on Sharpe now as I think many of the walleye are down even deeper than 50 feet on Oahe making them harder to catch. Weather is always a big factor with fishing but it will start to play a bigger roll as fall comes around. Colder nights/days make for colder water and the start of the fall bite and many years this is one of the better times for nicer fish. We shall see if this year brings that kind of bite and my reports will indicate if that is the case. I have been out of town for over a week hence I have been behind on these reports. Things have changed after the 1st of September on Lake Sharpe as the size limit of 15 inches is back on until next July. This has made coming in with limits of walleye more challenging however most days if conditions are right fishing is still very good. The conditions I mean are weather and the amount of current the corps run. Strong winds make for harder boat control and too much or not enough current can slow down the bite. On Sharpe right know as long as you can catch numbers of fish you can get limits but you have to throw back around 3 walleye in the under 15 inch range to get an over 15 inch fish so that is why it is a numbers game. 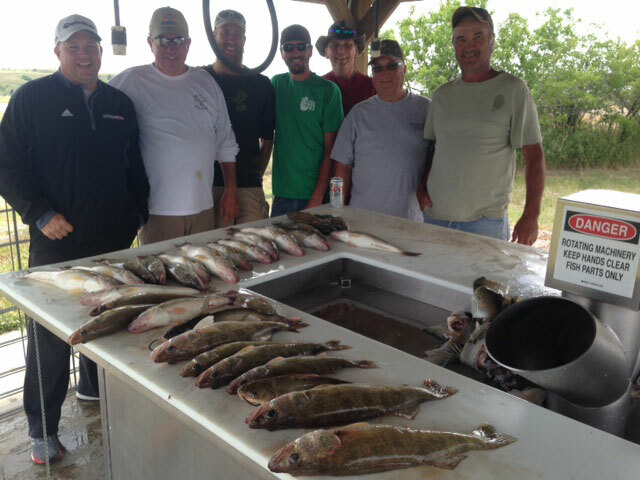 The last trip I did was with repeat customers the SEDERLIN group from down Kansas way and we had a great time. 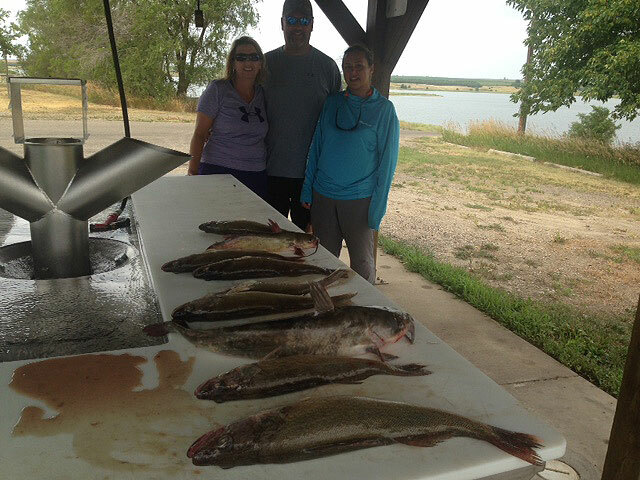 They went home with their full possession limit of walleye and also had a nice limit of smallmouth bass on Oahe to round out the trip. We caught all the fish on Sharpe with either nightcrawler/ bouncer or minnow/bouncer rigs in around 10 fow. 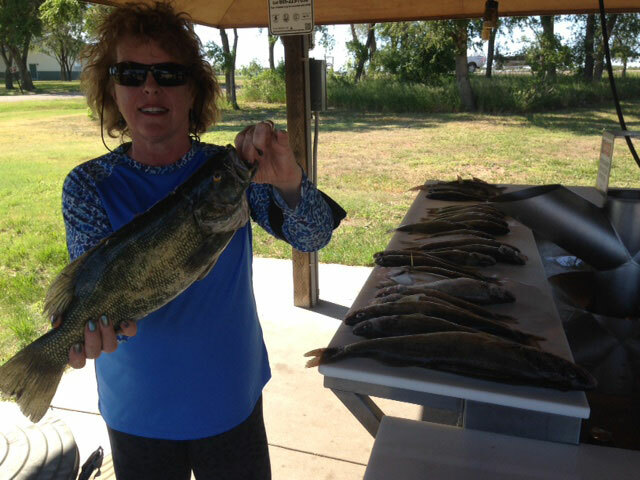 On Oahe we caught the bass in around 30 fow on minnow /bouncers. Lots of good eating for these guys and just a great bunch that make my guiding job easy and fun. Had a few other trips including the Wilke bunch that we did not picture the fish but basically it was the same story on methods and fow. Fall weather is starting to arrive with some 40 degree nights and cooler days. I might also mention the GFPS are stocking big numbers of catchable trout below the dam so for those liking to catch a few rainbow that is going on now. Salmon fishing has been and still is very spotty and although I am not in real touch with this bite from what I have heard is hard. Once again especially on weekends lots of boat traffic on Sharpe but you can pretty well have Oahe just about to yourself in many areas. If you want that kind of experience it is a great choice. We caught limits of bass easily and saw two other boats all day. 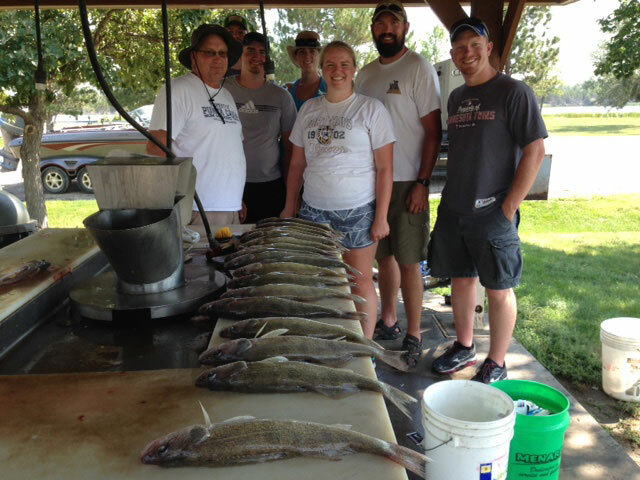 I fished the Ed Brummels family group from Ne. and KS. along with guide Scott Van Lierre for a two day repeat customer trip on Lake Sharpe. Just a great group with Ed being a Pioneer customer a few years back. The fishing was a little tougher because of a period of strong wind making boat control harder, I will mention a fact for those of you who haven't fished on Sharpe around Pierre. When the Corps runs a lot of current and you get a big East South East or North east wind blowing into the current it builds some real big waves in the channels were the main current is. This is real hard to fish and can be dangerous for inexperienced boaters that are unaware of this situation. This is old news for most fishermen around Pierre however if you are unaware of what wind into current can do it might help you be a little more safe. 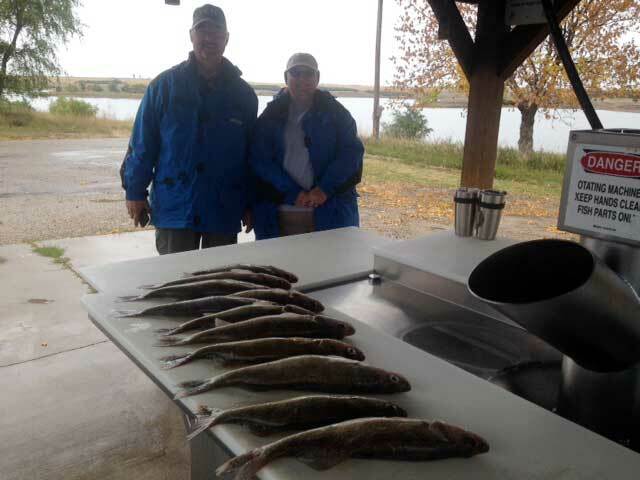 We caught some nice walleye in these conditions however did not manage to get their possession limits. This speaks to the fact that a lot of the fishing below Pierre ( the first 20 Miles or so) can be contingent on the current the corps run. No current and too much current can make for a tougher bite. At any rate the bite when the right current is on is very good. Weed growth is dying off bringing the fish out into catchable water around 10 feet. 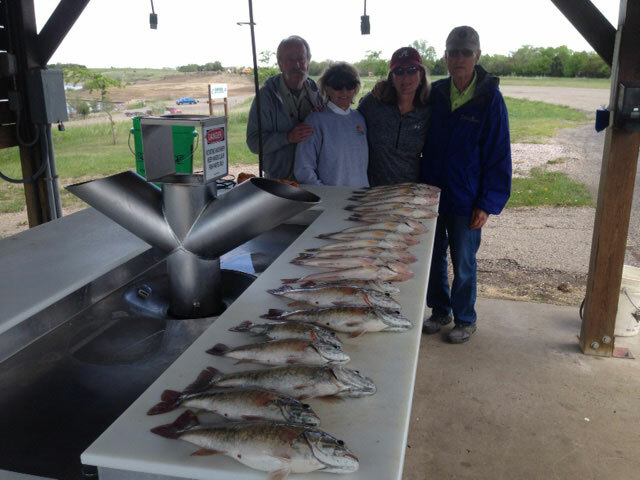 Oahe continues to have less boat traffic and is very good fishing for smallmouth bass and walleye eaters with the bass schooling in 20 to 40 fow . When you find a school the action can be great. 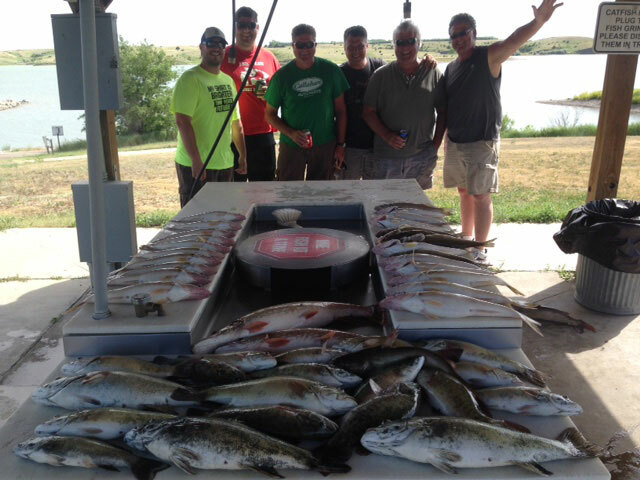 If you are looking for less boat traffic and some great fun with these guys Oahe is the right choice. I along with over 20 other guides finished guiding the second half of the CENTRAL VALLEY AG. 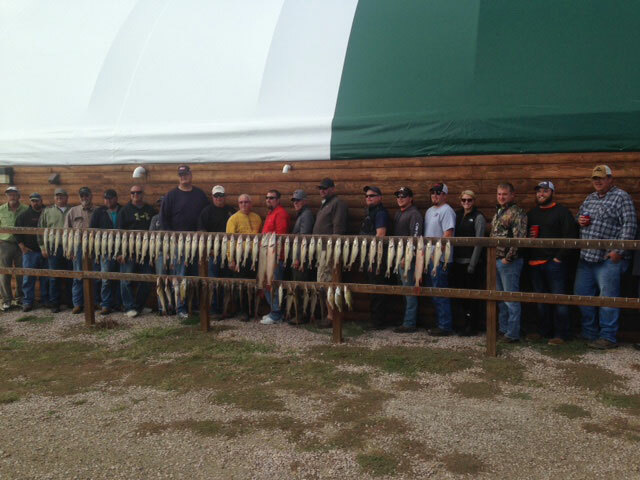 GROUP for THE OUTPOST LODGE with another big batch of walleye some bass and some catfish caught. Most of the guides including myself stayed fishing on Sharpe again using mostly different combinations of bouncer/crawler rigs. 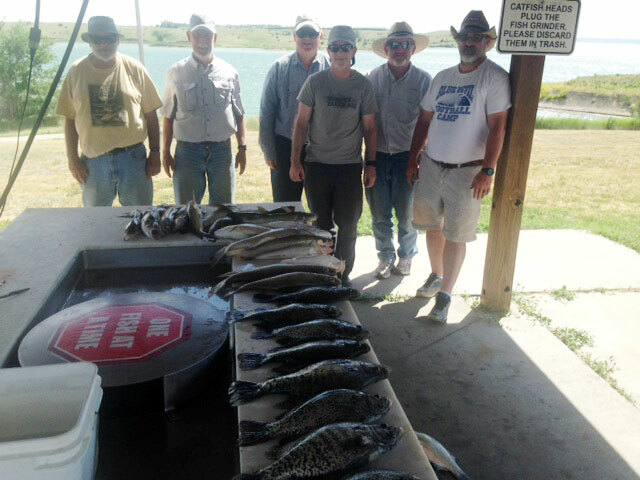 Some guides pulled plugs and some fished minnows with limits the rule. 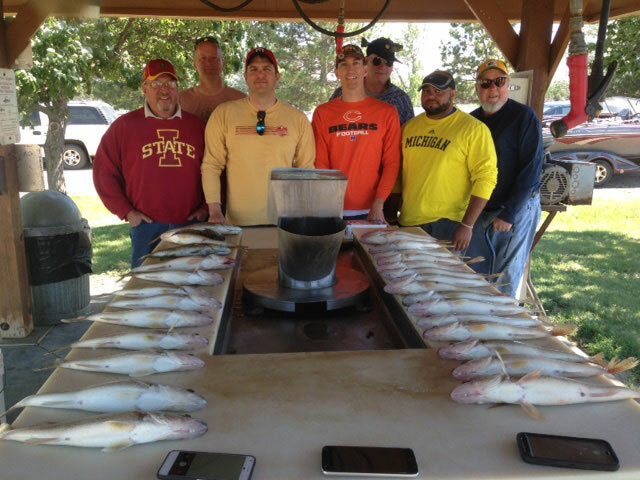 Most of these fish were caught in around 10 fow or less. 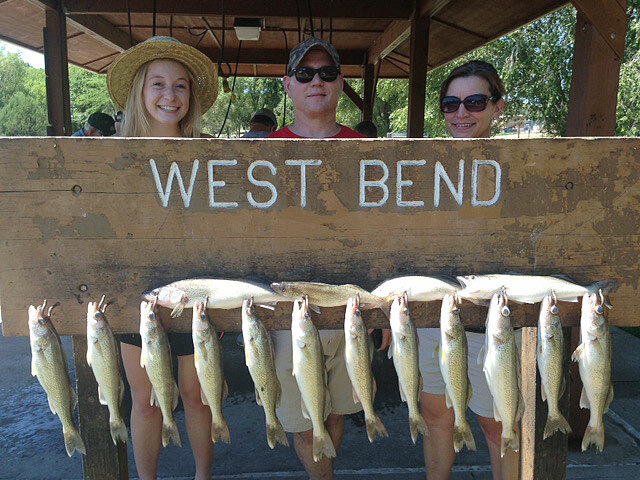 The average walleye was right around one lb. to one and a half lb. average. 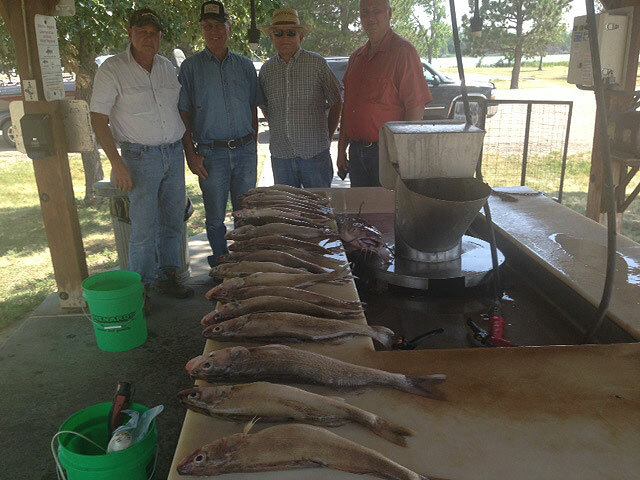 Lots of good eating again with a big fish fry for everyone along with plenty of fish for everyone to take home. CVA really know how to take care of it's employee's. Also once again all of us guides love the income and these guys are just a great bunch to take fishing. The bite on Oahe is less crowded and smallmouth are going along with smaller walleye and some catfish. Occasionally you can run into some over 20 inchers in both places. The smallmouth are schooling up and 20 fow to 40 fow and minnow/bouncer or drop shot baits are putting nice bass in the boat. The weekends are still very busy so look to be fishing around plenty of boats especially on Sharpe. 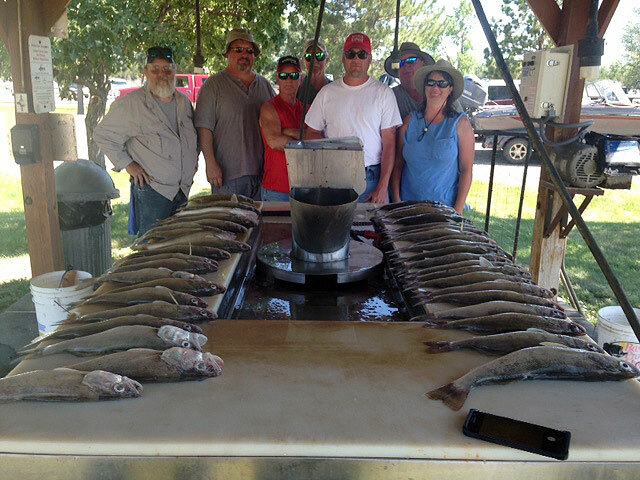 I along with around 20 other guides took the Central Valley Ag repeat group of customers out for a two day trip with another bunch of them coming up for another two days of fishing. The OUTPOST LODGE hosts this trip annually and all of us guides are grateful for the income it generates along with the great guys mostly from Ne. that we take out. I believe almost all guide boats came in with limits of fish and the big board was so full many didn't even picture their fish, There were some over 20 inch fish caught but for the most part these fish were eating size (14 to 18 inchers)and the guys got a huge fish fry along with plenty to take home. Most of the fish were caught on either nightcrawler/bouncer rigs or pulling plugs in around 10 fow on Sharpe. Minnows work as well as leeches. Still a good bite on Sharpe when the Corps run the right amount off current. Oahe is going great in many area's for smallmouth bass and smaller walleye and has a lot less boat traffic so if you are looking for less crowed fishing it is the best choice. CVA is an example off a company that really knows how to reward it's employee's and talking to them over the years in my boat these guys appreciate these trips and it makes for real good attitudes about the company they work for. A super way to repay hard workers. Stay tuned for the next report about the second half of this great group. I had a few days off then took the Clarence Wohlwen family fishing following up with Doctor Pete Looby and son for a two day fish out of SUTTON BAY RESORT/GOLF COURSE. A couple of nice customers that I enjoyed. 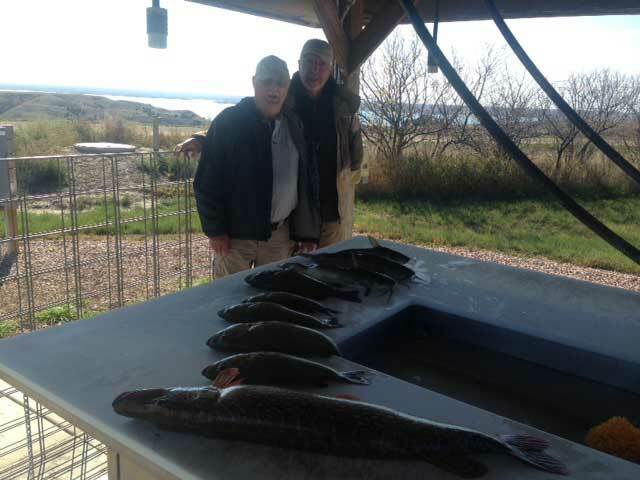 I fished Sharpe for the first trip and Oahe the second trip. Both trips we didn't picture the fish. 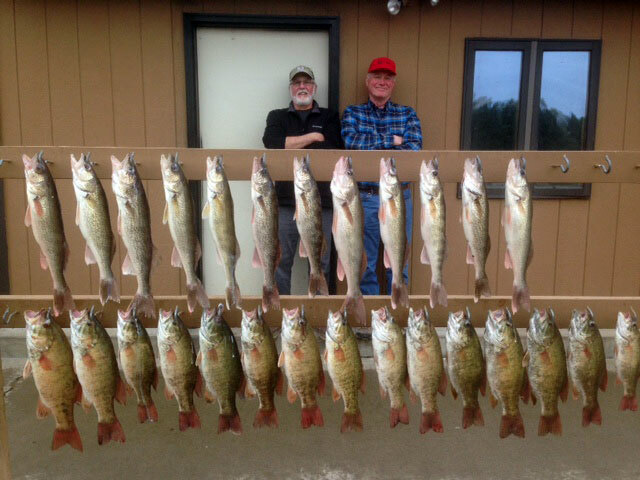 We caught possession limits on Sharpe in a lot of boat traffic with no smallmouth but on Oahe the smallmouth fishing is starting to go now with the fish schooling up in 20 to 40 fow and catching them along with walleye was real nice for the Looby's. The bass were caught on minnow /bouncer rigs and the walleye went for nightcrawler/bouncer rigs in around 12 fow out to 30 fow. For those who like less crowed waters Oahe is the best choice with eating size walleye and real nice bass coming in. I get a lot of negative comments on keeping the smallmouth bass but they are good eating and I believe a balanced harvest of all species makes for a healthier over all fishery. I guided for 28 winters on Lake Fork in Texas and never kept a largemouth bass but that was an entirely different set of circumstances. Fork is around 35 thousand acre lake with a tremendous amount of fishing pressure so the balance of fish wasn't considered to be as important as a total wipe out of the bass fishery hence catch and release was important. Smallmouth eat more of the same bait fish that walleye and other species do and have a tendency to take over a lake if not harvested equally as witnessed in Lakes like Mille Lacs in MN. There you can not even keep a walleye any more in what used to be one of the greatest walleye lakes in the country. There are other reasons on this lake than smallmouth over population but it is certainly an example of under harvesting one species. I am not a biologist just a fishing guide so the above statements come from observation rather than a formal education but I believe them to be true. Most of the guides up and down the river recognize the eating value of the smallmouth and harvest them for there customers and I personally think it is the right thing to do. I also know that keeping bass gets some bass fishermen up tight but I think most people prefer a balanced fishery with walleye being most peoples main choice to fish for. I think before fishermen put out negative comments about eating a nice meal of smallmouth they might look at what can occur when you under harvest any species in a lake big or small. Catch and release is a great way to go especially on bigger fish but on a balanced basis of walleye smallmouth northern etc. I think when GF&Parks disagree they need to make different regulations to protect what will support the best fishery and I think that limits are something we can all agree on and honor. I finished guiding the Richard Obannon/Guy Anderson group of Stepfather Mother and son from around Westfall Kansas. 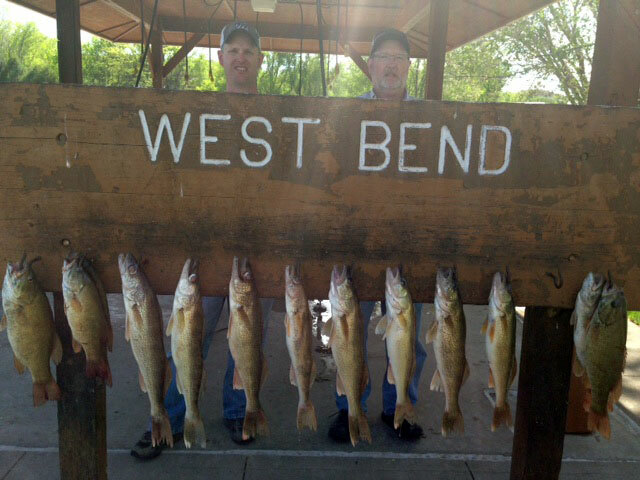 We fished both at West Bend on Sharpe and Oahe. Just a great bunch and I had a great time taking them fishing. 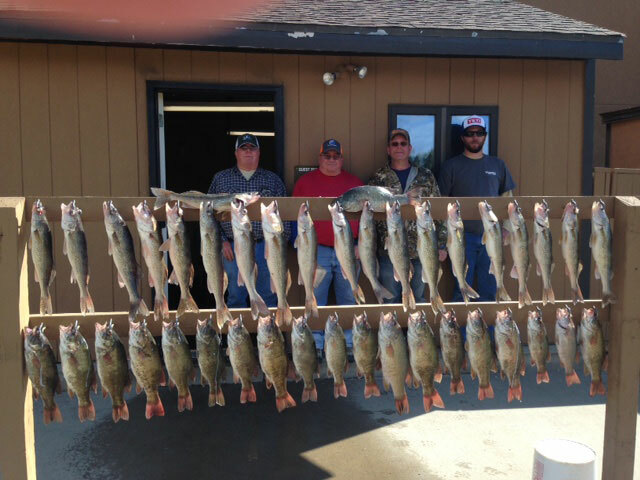 They went home with full possession limits of walleye along with some smallmouth bass and catfish. One nice northern was released and they had fish suppers for two nights. 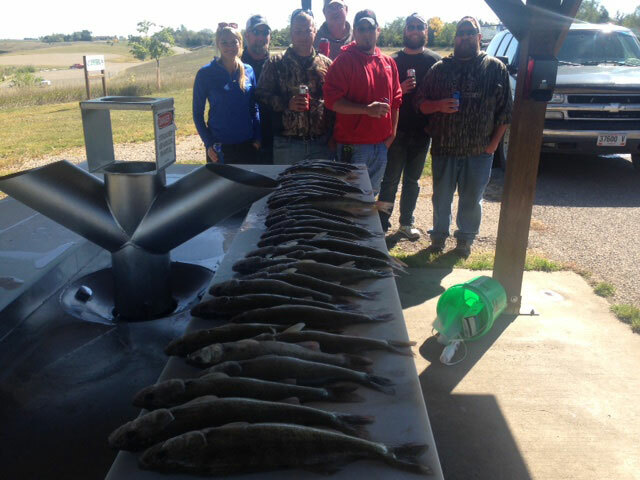 We caught the fish on bouncer/ nightcrawler rigs fishing anywhere from 12 fow out to 30 fow on Oahe. Most of the walleye were smaller eating size fish but they did have some larger fish mixed in. I am very lucky to continue to have real nice family's like these folks to guide and they were good at catching the fish when over them so my job was easier. I think most fishermen are coming in with limits however this year the big fish in most bags is less. Sometimes you do land on nice fish so nicer limits are around but many of the limits coming in have smaller fish in the coolers. Still great eating and fun to catch so having a good time on the two lakes is for most in the cards. Fishing on both lakes remains the same with most boats coming in with limit's if they keep the smaller eating size walleye. Sharpe probably has a little better small fish size with Oahe still holding the edge on more big fish but limited big fish numbers. I helped Dave Spaid guide repeat customers the Capitol Motors group ramrodded by Vic SR and Vic Jr. A great bunch of guys/gals mostly from around the Gillette Wy area. 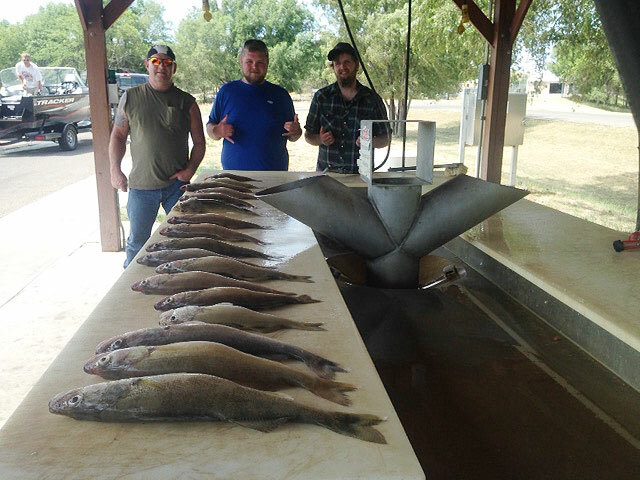 We spent the time on Sharpe catching limits of walleye a few catfish and a few smallmouth both days so they had fish fries while they were here and took home possession limits of walleye. Once again a company that knows how to reward its hard working employee's. All of us guides involved are real glad to get the work. 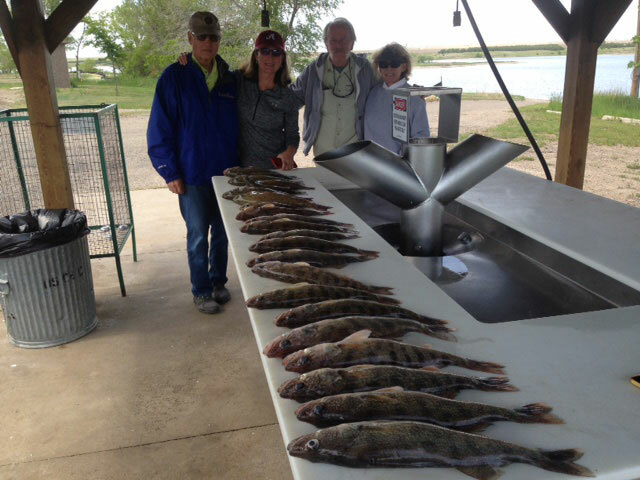 Went on to start guiding the Richard Bannon group of Stepfather Mother Son on Oahe for first day limits of walleye and a few catfish/bass. Looks like another great group and I will fill in the rest of their trip on the next report. On Oahe the fish have moved deeper and we caught fish from 20 fow down to 35 fow using nightcrawler/bouncer rigs and used the same on Sharpe staying in around 25 fow at the bend. Weather still summer but cooler with temps in the 80's. Boat traffic is slowing down a little especially during the week so boat ramps not as busy. Flies are around some days so bug repellant and lots of water/sports drinks help make for a better trip. I just finished guiding two couples from around the Marion Ks area. The Dotsons and Fanter's could certainly turn out to be in the numerous all time favorite repeats if they return next year as I really enjoyed taking this group. 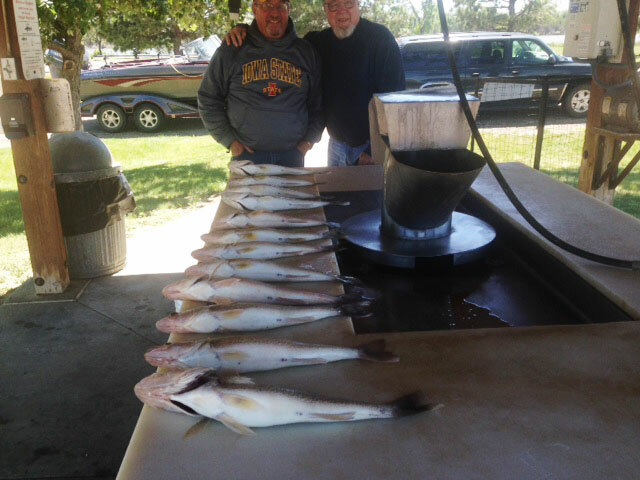 We fished Sharpe for their trip catch of full possession limits of walleye and a few other species. 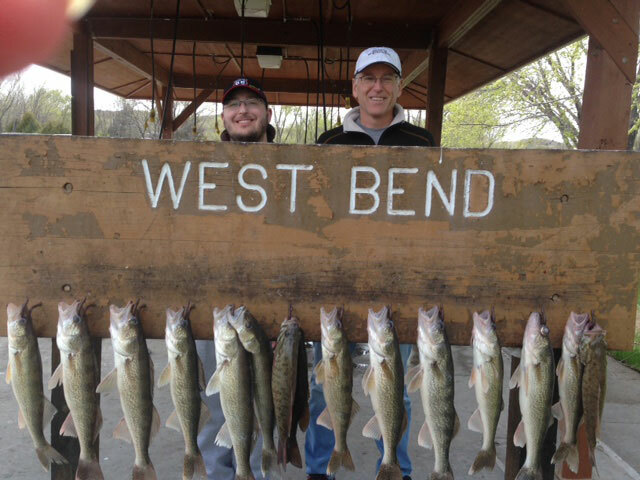 We did not catch a lot of bigger walleye but at West Bend the numbers were very good catching and releasing. probably four fish for every fish they kept. The catch was eater size walleye mostly and we caught these fish in depths from 12 fow out to 20 fow on nightcrawler/bouncer rigs some plain hook and some smiley blades. It always helps us guides when we have experienced customers. All four of this group knew how to catch the fish making my job easy. The weather was summer (hot) but for the most part we had a nice breeze blowing so we really didn't notice it until coming a shore. Some days there are biting fly's around so be prepared with either repellant or long pants. Drinking plenty of liquid's like water or sports drinks are just a must on these hot days. The fishing continues to be a good numbers game but many day's just a few big fish in most catches. Fishing pressure is thinning down some especially during the week so finding places to fish with out numerous boats around is easier for those that like finding spots to fish with out a lot of pressure on them. I think almost all the big catches that I have had over the years did not involve fishing in community spots. Hunting new spots and just hunting the fish has always been what kept me interested and excited about every new day on the water. Love to eat walleye and love for my customers to catch them but the hunt to me is the best part. 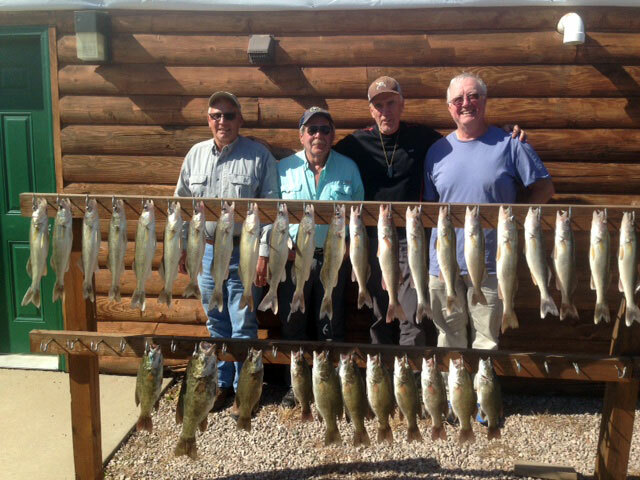 I guided four fellows from Ne ramrodded by Richard Eisenhauer to possession limits of eater size walleye a few catfish and a few bass fishing on both Oahe and Sharpe. We fished with nightcrawler spinner rigs in around 20 to 30 fow both places and caught fish both places but the over all size was smaller eating size fish. I then went on to take another of my favorite repeat groups out fishing on Sharpe from Pierre down to West Bend and catching lots of fish with a few over 20 inchers along with some real big catfish. Once again we fished crawler/spinner/bouncer rigs from 10 fow down to 30 fow in different areas to catch the fish. 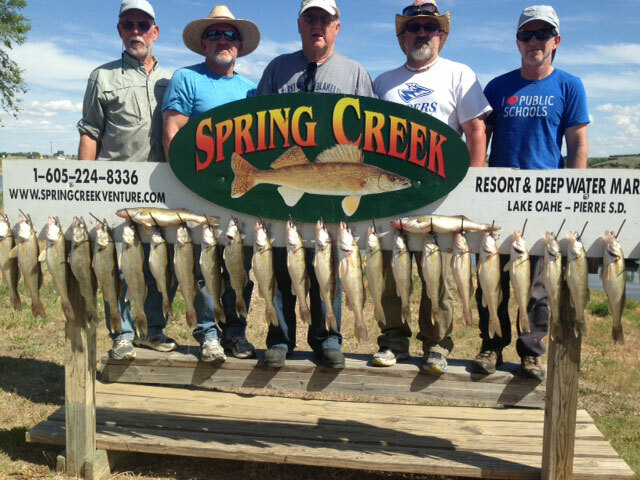 This group from around the St Ed Nebraska area and lead by Jay Wright and Scott Rammaker have been fishing with me for years and are just a great bunch. 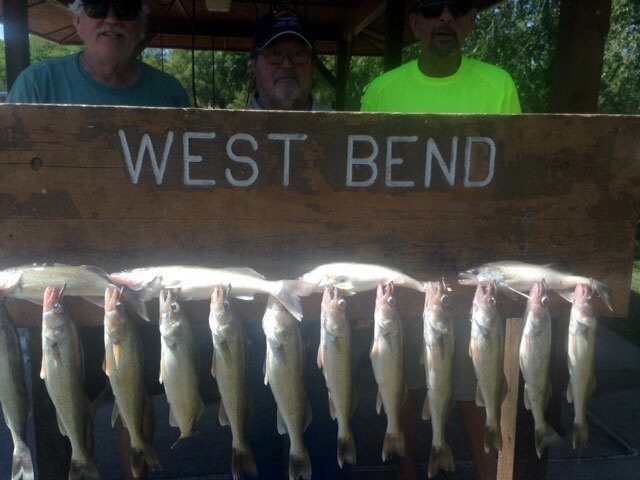 We caught probably over 50 fish a day releasing the smallest walleye to keep them full possession limits along with walleye meals every night while they were here. The weather was hot but so was the bite so a great time was had by all including the guides. It is summer so gator aid type drinks or lots of water are a must. Plenty of fly's around so even though Bermuda shorts sound good some days long pants protect against these biters so bug spray and a pair of jeans can be useful. Leeches pulling plugs and minnows all work so on both lakes so if you have a favorite bait you can come in with fish. Size has been smaller this summer but most days some bigger fish are in the bag two. Lots of days are producing numbers of fish so even though they are smaller lots of action isn't all that bad. I guided the Gerdis family of father/sons ramrodded by Tim Gerdis all from Iowa way. 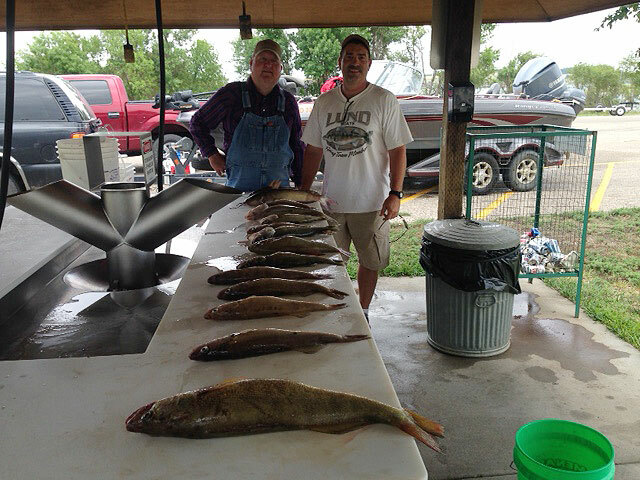 We fished both Oahe and Sharpe catching the biggest over all average on Oahe in depths ranging from 10 fow to 30 fow. 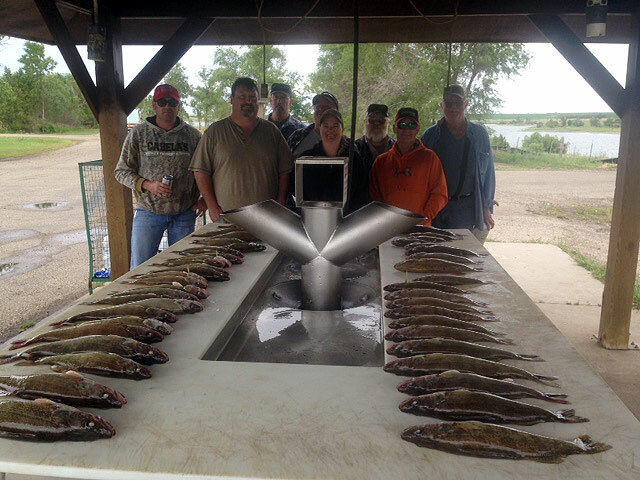 We used bttm/bouncer/nightcrawlers and got this crew full possession limits of walleye along with some catfish and smallmouth bass along with some fish suppers while they were here. Hot weather was around so getting off the water with limits was a plus. The governor's cup tournament is now history with the team of Marsh/Marsh winning with a 12 fish limit of 34 lbs and some ounces with Butch Appleserth and Mike Kulm day one leaders dropping into 2nd place followed by last years winners taking third place. 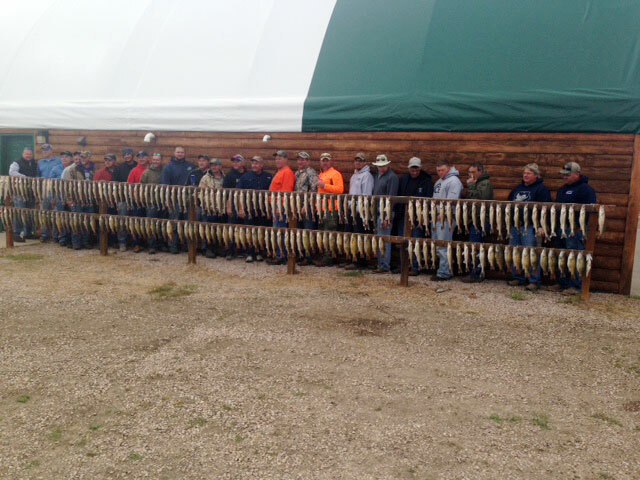 The over all avg of over a hundred teams was around a 1lb 1/2 avg speaking to the fact that we have a lot of smaller walleye in the lake right now. 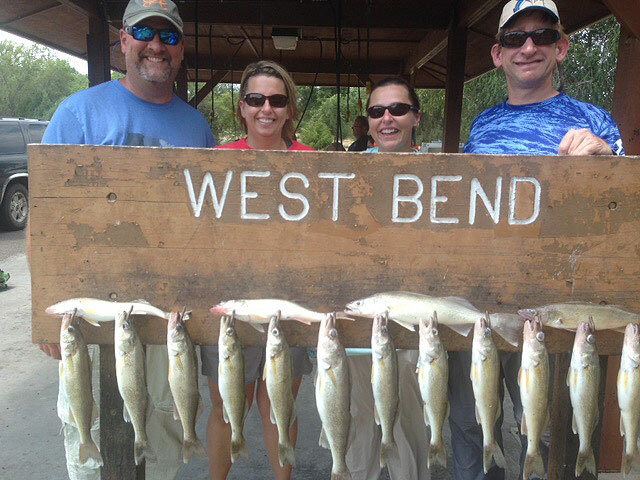 The leaders did a great job finding the bigger fish and congratulations go out to them. 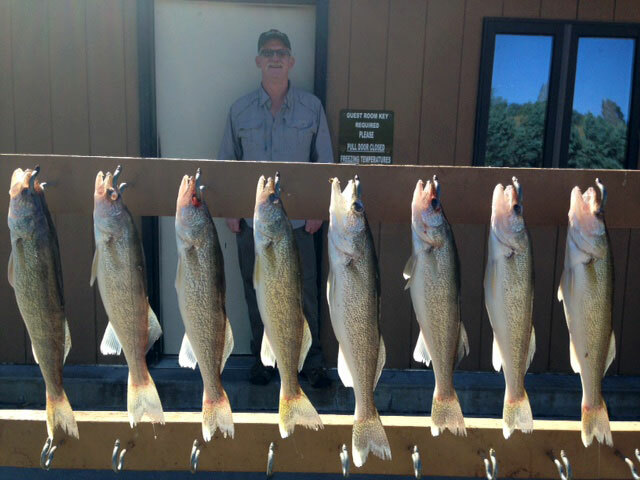 Guiding on the big lake this summer has resulted in the same kind of results as most days we catch lots of smaller eating size walleye mixed with a few bigger fish. 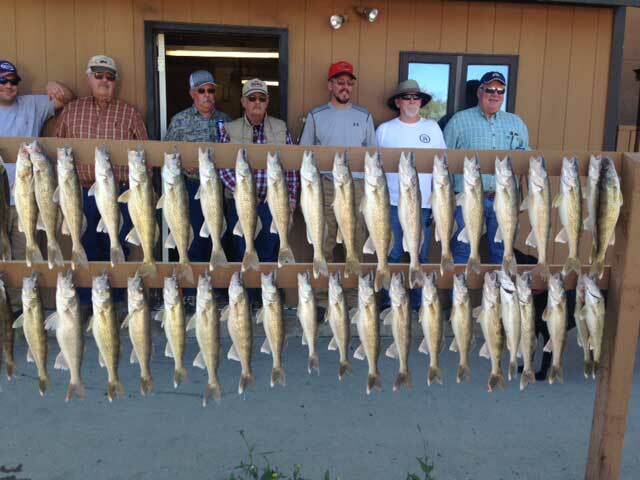 To me this indicates next year should have a good year class 15 to 17 inch fish along with some bigger fish so Oahe continues to have a nice walleye harvest. The summer bite is in full swing along with summer weather so fluids in the boat are a must along with fly/bug repellant and sun screen. Just finished guiding a real nice bunch of guys ramrodded by Tom Wilberg from Pierre his dad and uncles and friends from MN and one from Colorado for a two day fish on Sharpe. 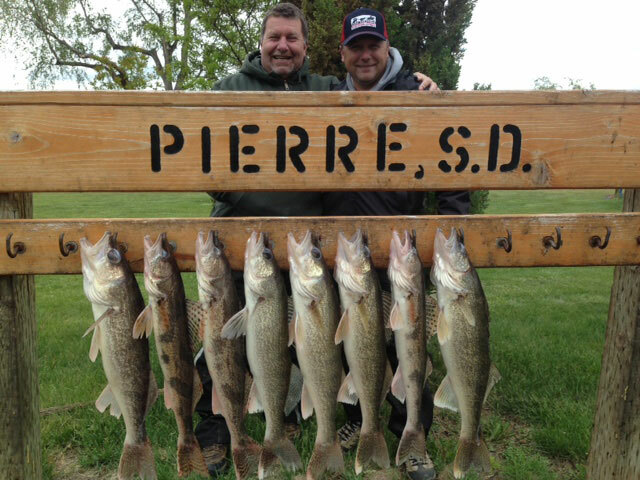 Scott Van Liere helped and we put limits of real nice walleye averaging around 17 inches. We caught most of these fish in 25 to 30 fow around sunken tree beds with both nightcrawler/bouncers and minnow/bouncers. Had a few touching 20 inches along with a lot of nice eaters. To keep that avg we probably caught 30 to 40 fish a day per boat so fishing is still great on Sharpe. I will have more to say on Oahe after the Governor's Cup this week end but I already know that some have figured out where there are some nice fish as Mike Kulm Rapid City angler and partner Butch Abelesth Rapid City SD are leading day one with 19 LBS and behind them a 17 LB stringer. Give some of these real good sticks some time to figure out were to catch some nice fish and they will. I will try to give an up dated report after the tournament is over but an over 3lb avg for the lead by Kulm/Abelesth is a great job. Plenty of hot weather around so liquids (water gator aid etc.) in the boat are essential to safe trips. Weather has been hot but nice making for some great days to spend time on the lakes. 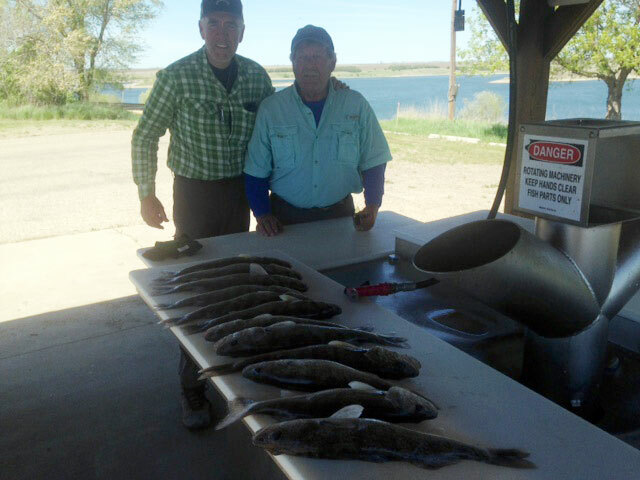 I guided Gary Boltz and friend fishing both on Oahe and Sharpe and catching them full possession limits of walleye plus some other species. They also had walleye meals for two nights so they took some nice meals home along with supper while here. A couple of great guys with fishing experience making my job easy. 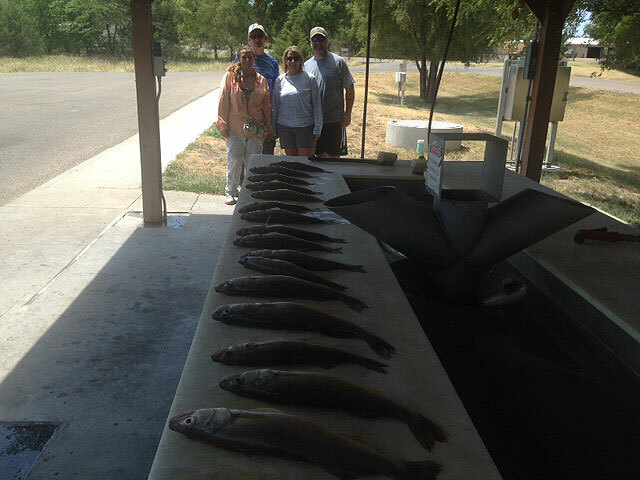 We caught the fish on Sharpe with smile blades/crawlers and also pulled flicker shad plugs in depth of 10 fow to 25 fow. On Oahe we stayed under 10 fow using crawler/smile rigs. Plenty of fish both places but size was small keeping mostly the eating size fish. They did have some fish around the 18 to 19 inch size in the bag to make over all catch's acceptable. I will mention the Governor's Cup tournament is this weekend so it will be interesting to see how the field fair's. I will post the overview on my next report. A lot of the better fishermen are fishing in this so it should say a lot about the fishery in general and I expect some good weights along with a lot of smaller fish coming to the scales. I think it will be a real hard tournament for many this year as the bigger fish are harder to come by this year. Lots of water/sports drinks in the boat is essential to a safe trip in the summer heat. 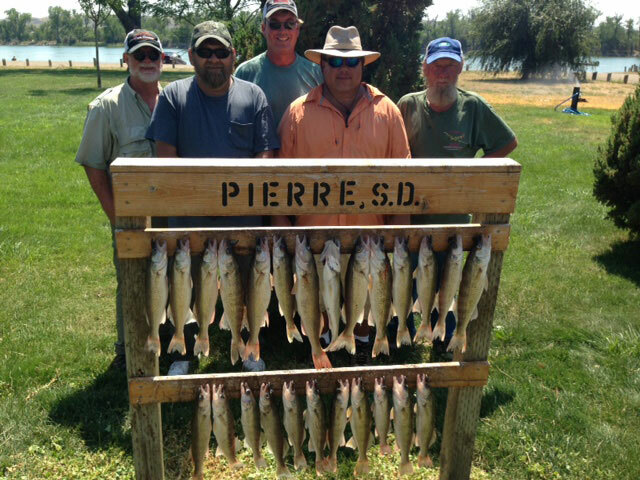 Fishing remains good around Pierre on both Sharpe and Oahe with plenty of limits coming in but most bags have a lot of eater size walleye. 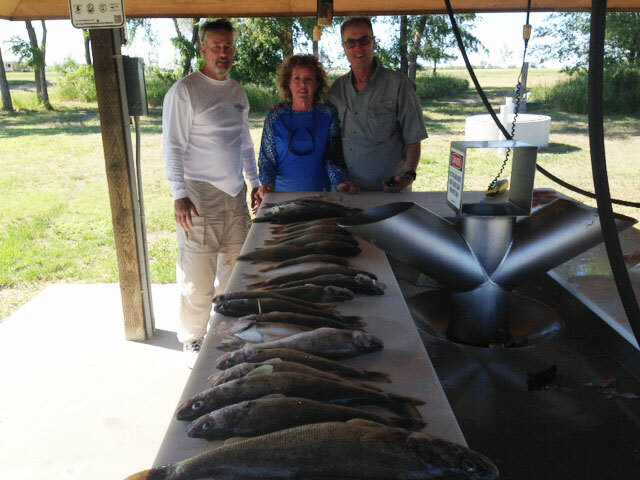 I guided Earl and Carol Hoffman from Michigan to limits of walleye fishing right around Pierre on Sharpe. 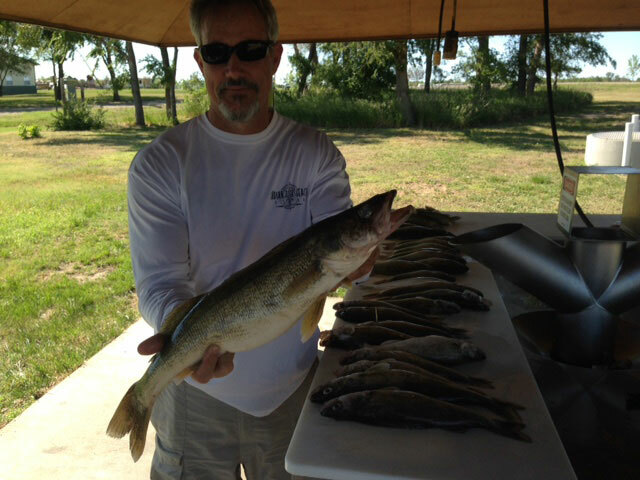 We caught the walleye in under 10 fow both on flicker shad plugs and nightcrawler/spinner rigs. A great couple here for the Bee convention. Ended up with a real nice Jar of Michigan honey along with some nice memory's. Speaking of Memory's the next bunch of repeat customer from around Cario Ne. ramrodded by Bill Hegar have a lot of great ones with me over the years and continuing the tradition we caught limits both days one on Oahe and on Sharpe day two. Another of my favorite groups and fortunately we had great weather both days along with a great bite. We caught the fish on Oahe in around 10 fow or less pulling spinner/bouncer/crawler rigs and stayed with that presentation on Sharpe but fished down to 25 fow. I am real blessed to have groups of repeats like this and can certainly say I picked the right lakes to guide on years ago as the fishing we have here makes for repeat business. I could not have made a living with out these kind of groups. Then went on to do a trip with the Symyr Group for a day on Sharpe catching full limits of eater size walleye before the heat (104) set in. A nice bunch of guys from Omaha and they went home with some great eating. Lots of hot days now so plenty of water/liquids in the boat and that brings up the tip of the day that I learned from some Doctor clients of mine. I told them I get cramps at night on some of these real hot days and they recommended drinking a lot of drinks like Gator Aid or similar ones with the right stuff in them. If I do that it seems to keep the cramps away. Staying hydrated is really important in these 100 degree days and sports drinks are a real plus along with water. Heat stroke is a real dangerous condition so taking every measure to guard against it is just good sense, Bug spray and sunscreen fill out the other things to have in the boat along with a lucky penny. 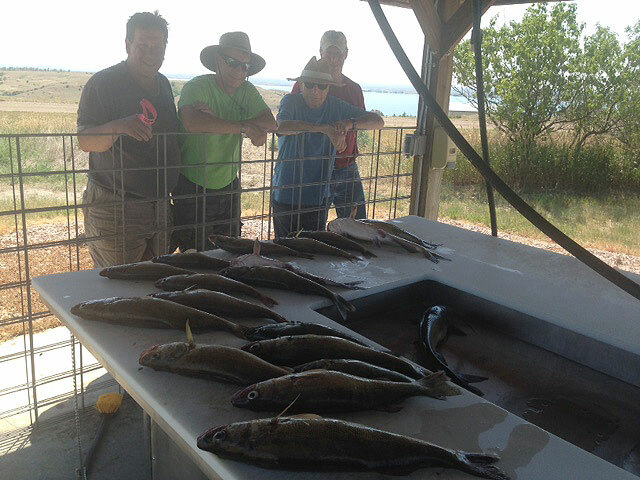 I hope every one had a great 4th celebrating and if you are fishing you probably are as the weather has been great and so has the fishing on both Sharpe and Oahe. I and Scott Van Lierre took the Austin Stewart group from Ne. out for a day of fishing to celebrate an upcoming wedding (bachelor Party) and we had a great time catching them full limits of walleye. Then took a nice family Jeff Stokes from Lincoln Ne. his wife and daughter for a full limit of walleye. 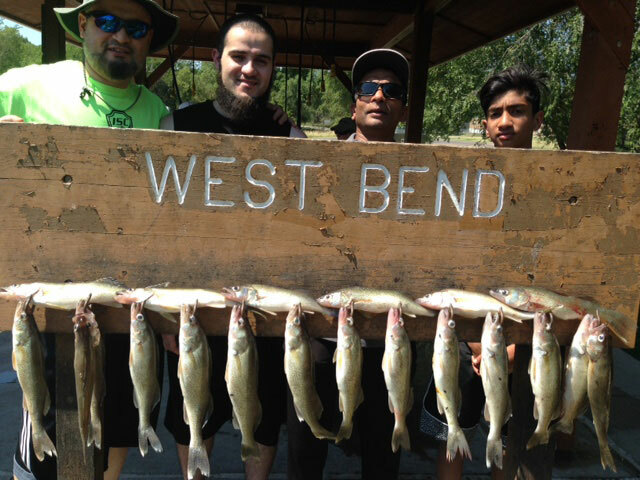 We fished both of these groups on Sharpe catching and releasing lots of fish to end up with over 15 inch eater size walleye and a few over 20 inchers. Fished with nightcrawler/bouncer spinner rigs in depths averaging 20 fow. Sharpe is still the easier fishery especially for one day trips but there is more boat traffic than Oahe. 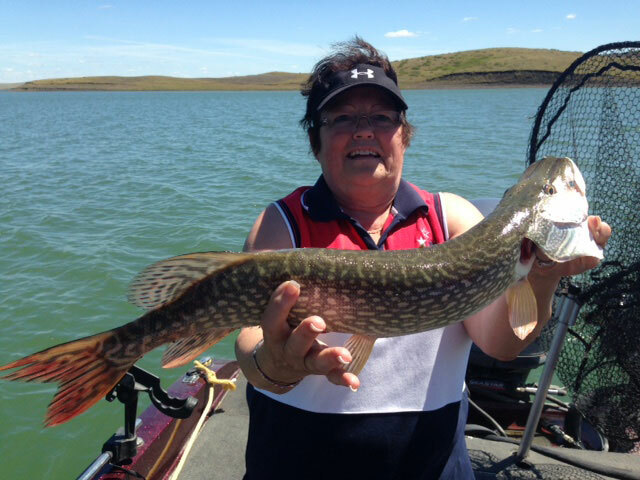 Oahe offers a better chance at bigger fish and other species like Northern Pike so take your pick. Less traffic but a little more spotty bite or numbers of eater size walleye. Both of these groups were new business for me and I hope to see them return as repeats as that is what makes my business work. Two great trips so odds are I might see them again. Summer is here for sure with some temps hovering around the 100 mark so sun screen and lots of water are necessary. If there is a breeze blowing across the water it is not as noticeable (heat) but when you get on the banks getting to air conditioned cabins asap is preferred. Generally the over all bite on both lakes is good but getting size is tougher many days this year. Still it is hard to complain about days that you can catch and release 50 or more fish. Most boats with any knowledge of the lakes are doing this on Sharpe and a lot of days on Oahe. Tips for those coming to fish. On Sharpe stay away from community spots and concentrate efforts around under water tree line's. They are full of snags but also under fished and produce a higher percentage of bigger fish. On Oahe especially when the wind blows there are still a lot of fish shallow in 10 fow or less so don't over look that water. I am just having a great time guiding more of my favorite repeat customers starting with Joe Reed from Spearfish and his boys the Aunne's then going on to finish the month out with Loretta and Dean Robinson Group from Hamburg Iowa and Eagle Ne. to limits of walleyes and meals while here. Scott Van Lyre helped on the Robinson group. 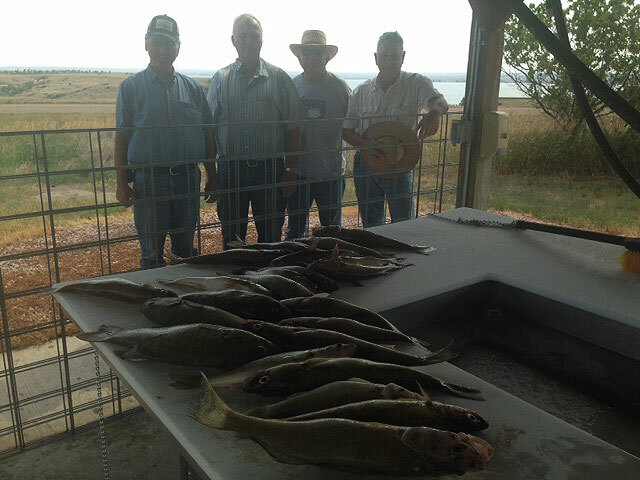 We fished both Sharpe and Oahe in depths from 5 fow in a rain storm on Oahe down to 17 to 25 fow on Sharpe. We used both minnow/bouncer rigs and nightcrawler/bouncer rigs. Had wind/rain some days and some great bluebird days making for challenging conditions but put fish in the boat most of the time. 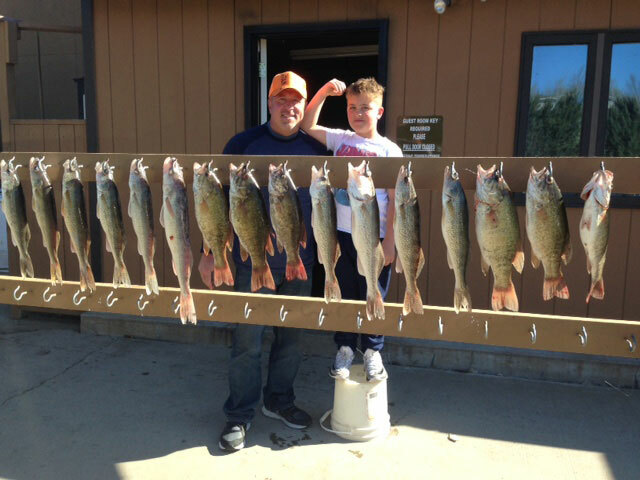 Fishing is going on Oahe but some days harder to find the bigger fish.15 inch size limits are now off on Sharpe so limiting out is much easier if you are looking for eater size walleye. Just real lucky/blessed to have so many quality repeat customers and most have already booked trips for next year so I will have something to look forward to this winter. Summer time is here so sunscreen, bug repellant and lots of water in the boat are necessity's. Lots of fishermen/campers etc. around for the 4th so every one be safe and have a great 4th of July. Once again guided some of my great repeat customer groups for a great outing sending them home with full possession limits of walleye along with some meals while they were here. 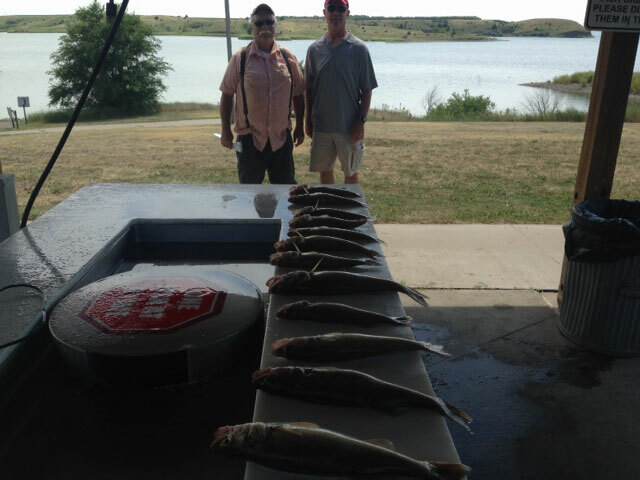 The Shaun Callahan (the voice of NE Cornhusker football) along with dad Pat Callahan (former Big Red Lineman) and group caught their fish on bouncer/nightcrawler or minnow rigs fishing both shallow and deep on Oahe and (5 fow to 25 fow) and fishing around 25 fow on Sharpe the second day. 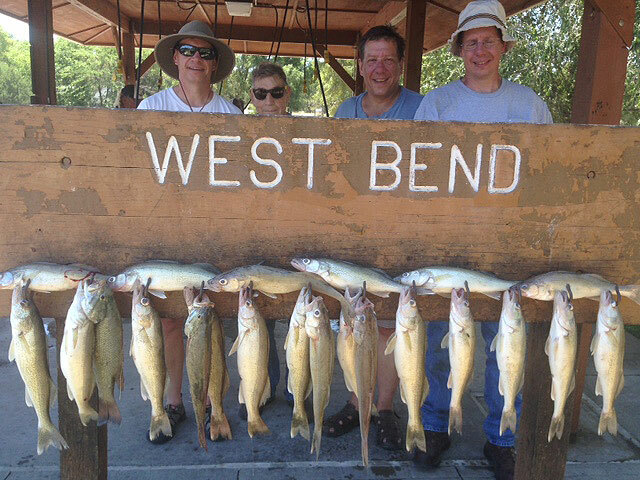 These guys are experienced fishermen so made the guide jobs easy and fun. One thing I will mention is the large 14 inch year class fish on Sharpe. Many boats are catching up to 50 fish a day and ending up not keeping limits. I have said before the key to this fishery for us guides is to fish away from picked over community spots and get on humps that are away from the heavy boat traffic. This means sometimes fishing in real snaggy (trees) spots that most boats avoid. This tactic will put a bigger ratio of keeper fish and bigger overs in the bag for you but will require more time to find and fish these kind of places but well worth the effort. In this Callahan group Shaun landed a 25 inch 5 to 6 lb. walleye along with numerous 18 to 19 inch walleye fishing right along trees (while I tied on around 10 bottom bouncer rigs that we snagged up) and a 25 incher is a real nice walleye for Sharpe and the others made for real nice stringers for this group. For some going thru this kind of effort isn't realistic but still the catching of 50 fish a day makes for a lot of fun for most. A reminder for those coming after July 1st until September 1st the 15 inch slot limit goes off so these 14 3/4 inch walleye can work their way into frying pans making for a lot of fish meals. I started to use smilee spinner blades on some of the rigs and they seem to work great. Many of the guides have been using these little spinners so if you haven't tried them they are easy to tie and can be worked at a faster speed. When releasing numbers of fish you will get less deep hooked fish along with minnow fishing and pulling plugs so that is also a plus. I along with Scott Van lierre guided the Pat Purlick group of repeat customers from Iowa to limits of walleye and a few bass. Weather was a big factor in this outing as the wind blew both days to 40 mph gusts so we fished on Lake Sharpe for the protection of the bluffs. I have always said wind is one of the biggest factors in catch's and this was no exception. We did get possession limits of walleye mostly in around 17 fow with either minnows or crawlers on bouncer rigs but had to earn them. A great bunch of guys and they seemed to have fun in spite of roaring NW winds. Both lake bites were slowed by weather and access to spots that were just unreachable in this howler. It looks like this northern front has moved thru so I expect better action all around this next week. Lots of boat traffic that was concentrated in areas that had some protection from the wind so many places were crowded. Over all the bite on both lakes is very good to spotty depending on the summer weather so cross your fingers when coming over and as always hope for those nice summer days. Remember to drain live wells/boats when leaving the ramp area's to comply with the new invasive species laws. After Dave Spaid took the Brown boys fishing on Oahe, I spent day two with them and experienced one of the toughest days I have had this year catching 7 fish all day and from what I heard it was just a real bad bite all over for a couple of days. Things started coming back yesterday so hopefully just some weather around causing this. I then went on to guide another of my favorite bunch of repeat customer's the John Hanson, Wayne and Chuck group all from around the Omaha Ne area. 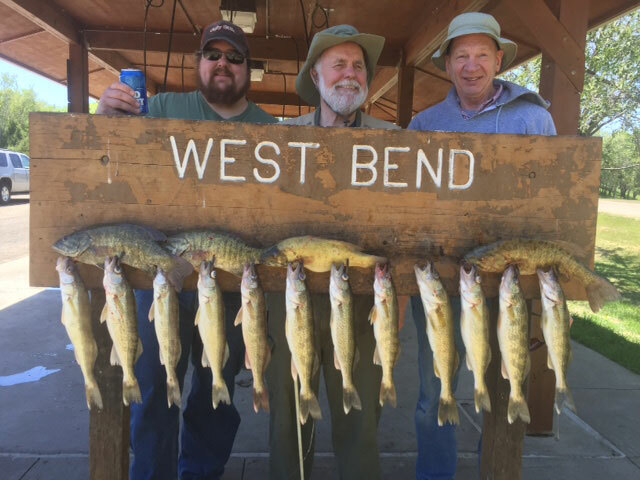 I have had lots of years of great times with these guys and we spent two days on Sharpe catching and releasing around 50 fish a day to put limits of nice 16 to 20 inch walleye in the boat both days. 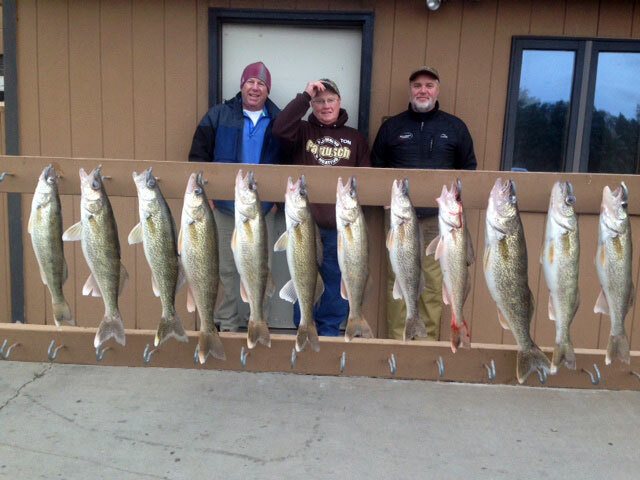 Possession limits for them to take home along with some great walleye meals while here. We fished nightcrawler/bouncer rigs in around 25 fow hitting tips of underwater ridge lines for the fish. Minnows and leeches along with pulling plugs all work so do what you do best if fishing here. Remember to take the time to be as careful as you can when releasing the under 15 inchers as the lake is full of 14 inch year class fish and you have to go thru a lot of fish to come in with quality stringers. Oahe went dead for a couple of days but for the most part is back on again and chasing bigger fish and especially the opportunity for big northern and other species along with bigger water and less boat traffic is an appealing option. Watching the weather this time of year is essential to safe trips and having lots of water, sunscreen, and insect repellant is also a real good idea. Once again I fish on a couple of great reservoirs and because of this have been able to generate a great repeat business like this group of guys. Lucky to have them for customers and friends. Fishing and weather is in a full summer mode. 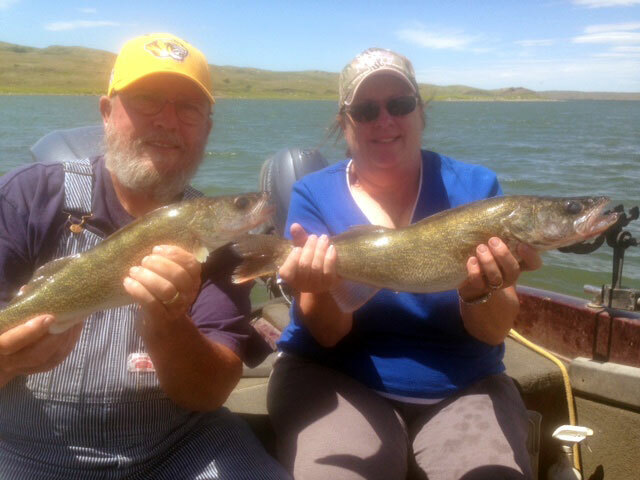 I guided Bob and Shelly Peetoom from down Missouri way to nice limits of walleye with some smallmouth bass on Lake Oahe. We caught the fish in 5 fow to 10 fow on bouncer/nightcrawler rigs. A great new couple and we all enjoyed the trip. Had some real nice fish to 23 inches and some numbers of 17 inch to 19 inch fish to fill out limits. I then went on to take out, along with Scott Van Lyre and Jody Cutler another of my favorite repeat customer groups the Nate Luhrs group from both the Omaha and western Ne areas.. We sent these guys home with full possession limits of walleye and smallmouth bass as bonus fish along with 2 big walleye meals while they were here. Had some weather with a fast moving front coming thru day two and we trailered the boat barely missing a real downpour with lightning and big wind. Lots of boat trailer's at the ramp so I think there were some real wet fishermen. Some times these storms move through real fast so keeping an eye to the sky and making inbound moves to the boat ramp can save you from some real trouble. Makes for lots of memories with these guys. Just blessed to have these kind of repeats to take fishing. The bite is still very good on both Oahe and Sharpe with the fish starting to move a little deeper some days but still a lot of fish up on the bank so don't overlook fishing in under 5 fow. I got another somewhat hostel comment about keeping smallmouth bass (the guy suggested I lie to my customers and tell them they are full of worms and are terrible eating) but my take on these fish is it is better to have an over all harvest of all species to keep a balanced fishery and they are great eating along with other fish like catfish etc. so unless someone provides info to the contrary I am going to continue to harvest all species in the hopes it makes for a balanced fishery rather than one that is overrun by the more aggressive fish such as bass. An example of under harvest of smallmouth from my view point is Lake Mille Lac's in MN. Rated as one of the best smallmouth lake's in the US but you can't keep walleye there this year. Other factor's enter in on this lake but personally I know a lot of fishermen around this lake that push for better harvests of these fish just to keep a balance of all species in the lake. Hotter days mean sunscreen, water and a good insect repellant in the boat. Plenty of boat traffic around especially on the week ends so be prepared to share boat ramps and cleaning stations. 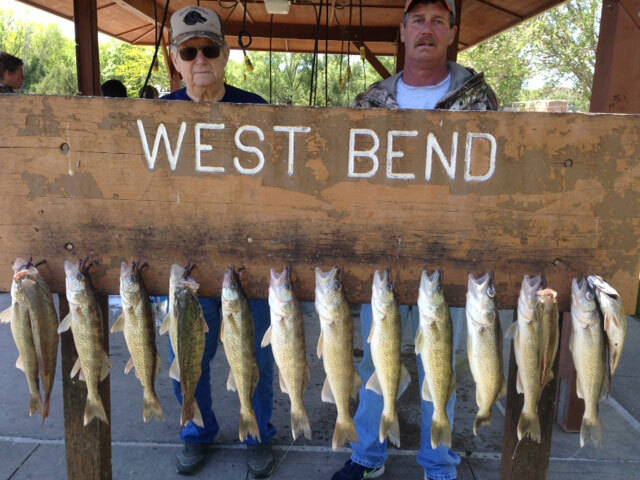 I guided another of my repeat customers and another all time favorite family Larry Janson and wife Marsha to full possession limits of walleye some bass and released big numbers of walleye along with 2 or 3 northern released. 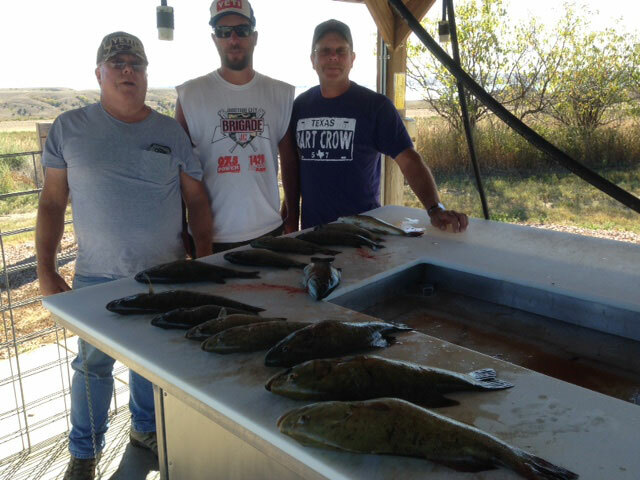 Went on Oahe day one and actually struggled some at first finding the fish but when we did we got limits. Sharpe was also a struggle in getting over 15 inch walleye (caught probably thirty 14 inchers) for a while but finally got on some bigger fish an put the limits in the boat by 1:30. Fished in 10 fow or less on Oahe and went down to 25 fow on Sharpe using nightcrawler bouncer rigs or minnow bouncer rigs as bait. The bite is very good most days weather permitting but some of these windy days makes for fishing in places to get out of the wind and as a result sometimes harder to put stringers together. Sunscreen, fly spray, and lots of water required if you want a better trip. Another great trip with a couple of real nice repeats from the Cornhusker State. 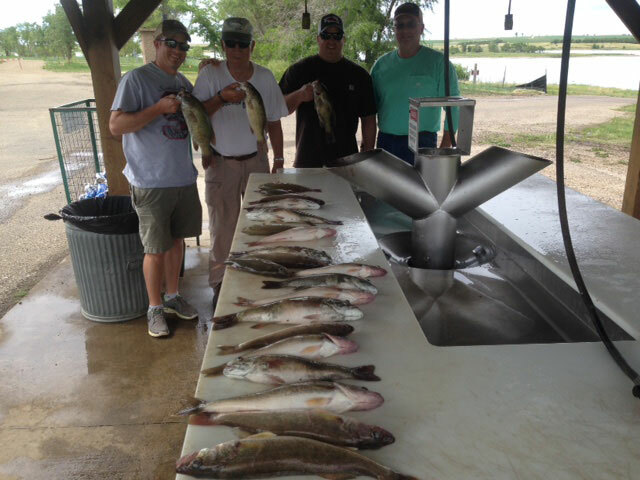 Some wind on Saturday dictated fishing down on Sharpe with once again some of my all time favorite repeat customers the Rezac family of brothers/sons. Scott Van Lierre helped me with these guys and both days we put limits of 32 walleye up for pictures along with smallmouth bass (4 over 19 inches) catfish, northern pike and white bass. 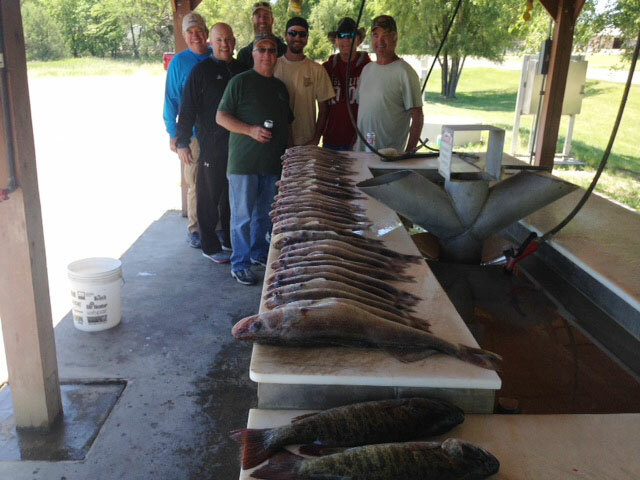 They took home full possession limits of fish along with fish meals while they were here. Day two found us on Oahe fishing in stained water of less than 5 feet using bouncer /crawlers bouncer /minnows and pulling flicker shad plugs. Used the same presentation on Sharpe however we did catch fish down to 20 fow at the bend. Most of the walleye we kept were in the 15 to 19 inch range and we had to catch over 50 fish a boat on Sharpe to come up with limits as the lake is just full of fish that won't quite make the 15 inch minimum. The bite can only be described as great and this group of guys doesn't get any better. They come from both around the Omaha Ne area and Madison WS. for an annual get together and as I have repeatedly said the lakes I guide on (OAHE/Sharpe) have generated great trips and have given my guide service over a 90 per cent repeat customer base or I would have never been able to make a living for so many years doing what I love. Having great family's like the Rezac's has made my job a pure pleasure. Hot Days are here so plenty of water and sun screen along with bug spray are necessity's in your boat. Once again I will mention finding your own fish is the real challenge to walleye fishing and if you spend the time to find spots away from community holes the benefits of numbers and size are worth the effort. Any one can find a bunch of boats and go fishing there. The best walleye fishermen are those who hunt and find the fish on their own and there in lies the real reward. Catching them is great fun and eating them is real good two but the real sport is the hunt from my perspective so go hunting. The bite is on big time. I guided the Davis farm group of repeat customers along with Gail Johnson and Dave Spaid helping me. This group of guys were Larry Porters customers and Larry used to hunt out at there farm so we always look forward to the trip but sure miss Mr. Porters involvement. 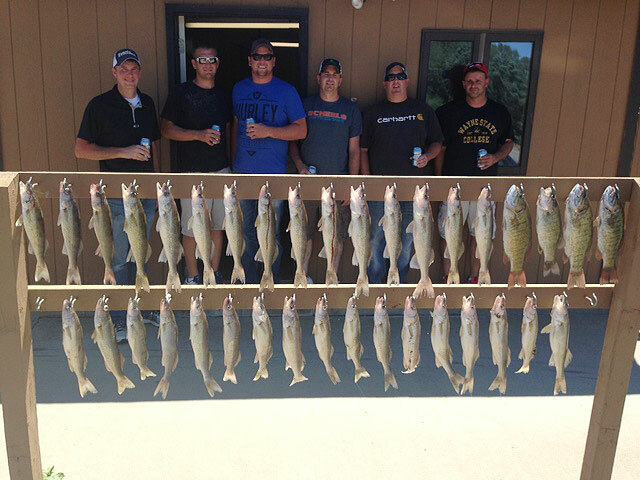 A great bunch of guys and we sent them home with full possession limits of walleye's and smallmouth bass along with catfish, crappie and white bass for lots of fish dinners at home in Nebraska. 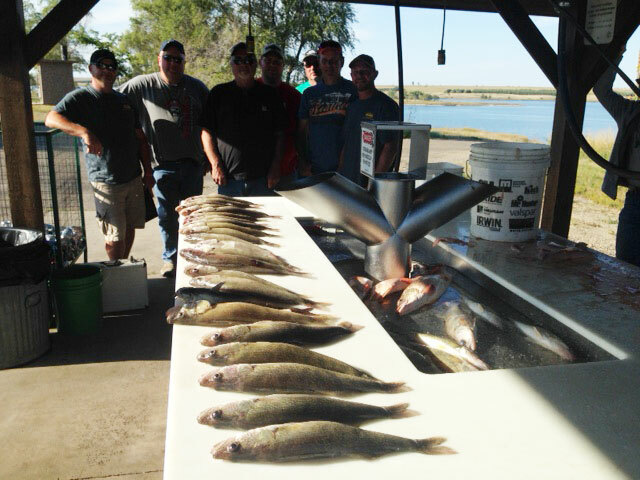 We fished both Sharpe and Oahe getting limits in around 4 to 5 fow for the most part and caught most of the fish on bouncer /crawler or bouncer minnow presentations however plug fishing works well also. We targeted stained shallow water for all the species we caught. A pleasant surprise were 10 nice crappies in the bag on the last day. Fishing is good now and the weather is summer with some hot windy days and flies/bugs out so repellant and sunscreen with plenty of water along in the boat makes for better trips. Thanks to John, Dean, Darin, David, Jim and Tim for another great time. See you all again next year. Beautiful weather and great fishing would be the way to start this report. 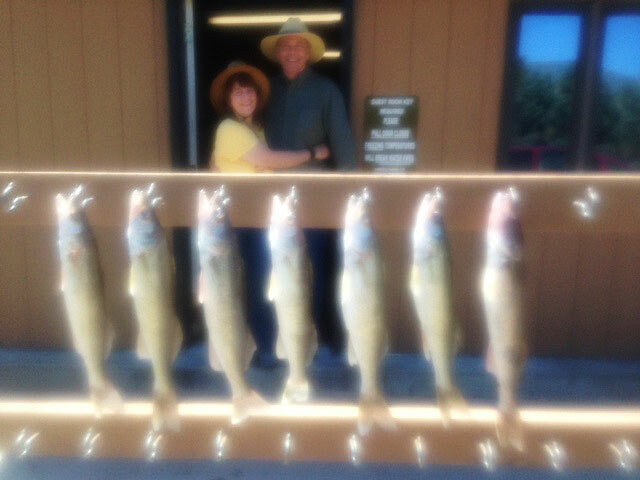 Everything was picture perfect for a June start including some great customers to guide fishing. 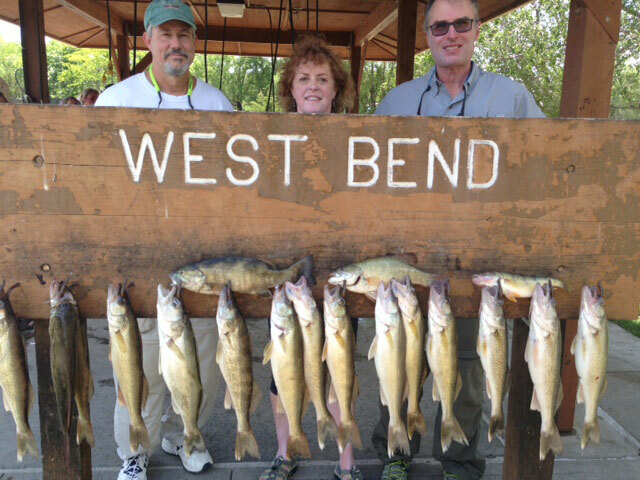 I started the month with Dennis Wolsey and crew fishing down at West Bend on Sharpe catching lots of eater size walleye getting them their limits and then went on to fish another of my all time favorite repeat customers Doug and Doug, and this year wife Francie Hays group from down Kansas way to full possession limits of walleye along with lots of bass and catfish for lots of fish to take home along with fish suppers here. A great bunch for a great trip. 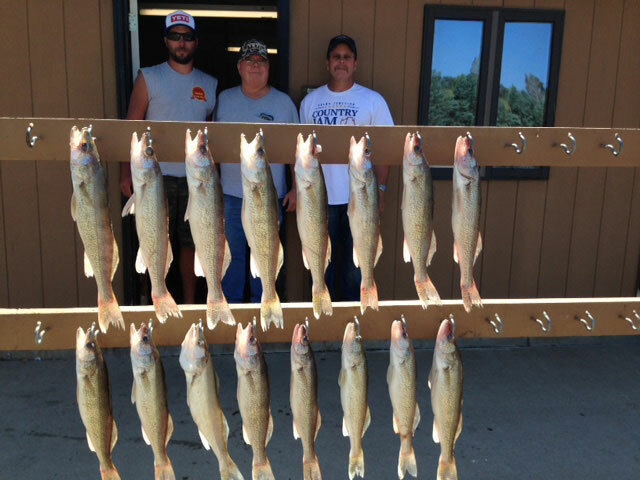 We fished Sharpe day one catching over 50 fish and keeping their limits on day one then went on Oahe day two for full possession limits of real nice walleye going up to some over 20 inchers with a 22 incher the biggest. The bite on Oahe is going strong now all up and down the river and there is no doubt if you want a chance at some bigger fish along with northern, catfish and bigger smallmouth (Francie pictured with a nice one) it is the right choice. Also less crowded boat ramps and water to fish. Fishing both places for us was shallow water (10 fow or less) and both crawler and minnow bouncers work with less swallowed hooks on the minnow or pulling plugs Bugs out along with the sun so repellant and sun screen are recommended. 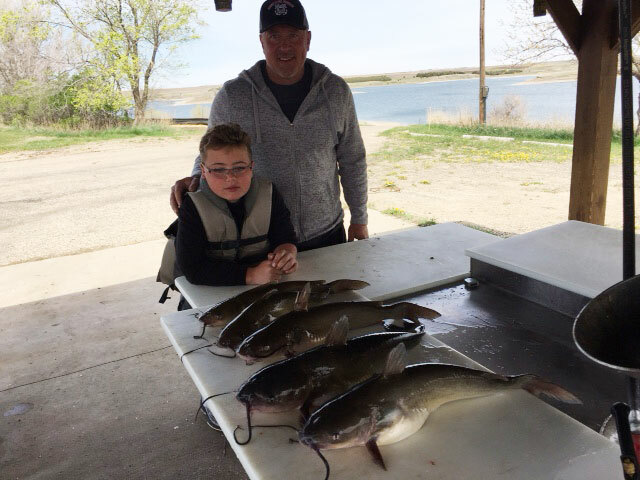 Fishing is going great for numbers on Lake Sharpe and Oahe is also putting out fish so the bite is in full spring/summer mode. Sharpe is the easiest choice for eating size 15 to 19 inch fish with an occasional over 20 incher especially at the big bend area. There is a lot of boat traffic however so be prepared to walk a little at boat ramps on weekends. I guided repeat customers Marv and Audrey Finn from WY. to full limits of walleye and some catfish catching and releasing over 50 walleye to get them a nice bunch of fish to take back home. A nice trip for all of us. I then took Ricard Crawford his son and his friend Dennis Melstad out for one day on Sharpe. They quit around after 5 hours of fishing counting 80 walleye caught and released keeping there full possession limit as the day before Dave Spaid took them and also caught over 80 fish keeping limits. Length limit on Sharpe is 15 inch minimum but lots of 14 inch fish everywhere so if you are wanting to catch a lot of fish it is your best choice. Most of the fish we caught were in around 10 fow and nightcrawler rigs seemed to be the bait of choice. Minnow rigs and pulling plugs all work. There is a nice bite on Oahe from the Cheyenne river north to Dodge draw with some nicer fish coming in along with smaller fish. Depths here range from shallow out to 20 ft. depending on area's fished with the same baits working. The Oahe bite is best described as spotty however and is more risky than Sharpe since landing on the walleye can be challenging some days. I am going to go to either pulling plugs or spinners when the numbers bite is on as it seems like you get more lip hooked fish that are easier to release with these methods. Hotter days are upon us so sun screen/bug repellant and lots of water are real good items to have in your boat. I took out a couple of WS guys Rick Korn and friend for a limit of walleyes catching most of the fish in around 10 fow on minnow/bouncer rigs. 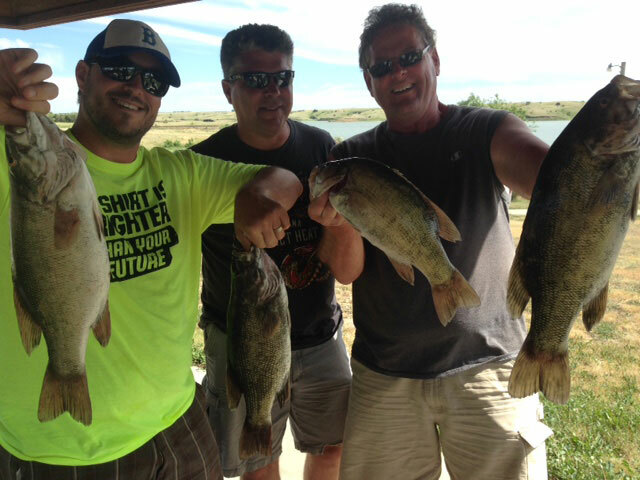 We fished both Sharpe and Oahe doing better on Sharpe. Then I went on to fish one of my favorite bunch of repeat customers the Owens and Roses from the Omaha Ne area for full possession limits of walleye and bass. Was just great to have these two couples back up again. We got the most fish on Sharpe again with some big wind but had a great time once again. We caught these fish also using propeller blades/minnows or crawlers. There is a real good bite on Sharpe and Oahe is going now so fishing either one can be rewarding. There was a lot of boat traffic over the memorial day weekend and this will probably continue so expect boat ramps in some area's to be busy. Fly's are out so a good repellent along with sun screen are good additions to a trip. Fishing in general is in full swing and the weather is generally better. 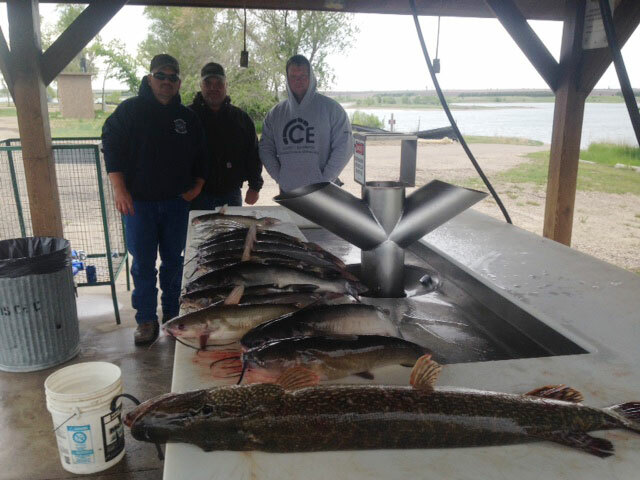 I finished guiding the three guys I had with the WILKE group by going after Northern and catfish on Oahe. These guys had full limits of walleye and some bass the first two days so they decided to do something different the last day. Clayton McKee got the only northern we caught an 18 lb. plus fish but we also had good action on catfish so they got a lot of extra fish to take home. Clayton was very happy as this was his first big northern. 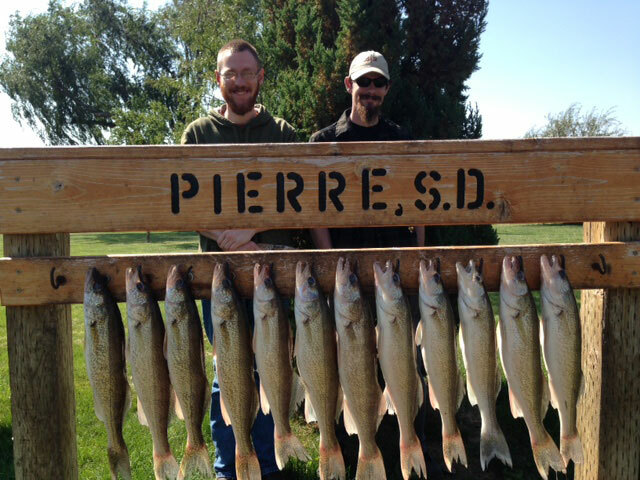 We caught these fish with slip bobber rigs/smelt in 3 fow way in the back of feeder creeks on Oahe. I then started a trip with repeat customers the Stumillers from ST EDWARD NE. down at West Bend on Sharpe in what turned out to be a real windy day. Fortunately the bite was great and we put limits in the boat by noon along with some nice smallmouth bass. Here we caught the fish in 7 fow or less on minnow/bouncer rigs. Fishing is in a full spring mode with limits for most experienced anglers the norm. Size is around an 17 inch average with some over 20 inch fish along with some 15 inchers. Water temps dipped back into surface around 48 degrees with very cold nights but it didn't seem to slow the bite on Sharpe. Lots of boat/angler traffic so the tip of the days is to avoid community spots and try and find batches of fish away from traffic when possible. This leads to more fish and usually bigger ones. Most of the guides try to avoid other boat traffic on a daily basis just to give customers a better experience and quite often bigger stringers. With the Stumillers we caught over 50 walleye by noon and never had another boat around us so finding a spot to fish by ourselves paid off. I think the fishing should continue to be great on Sharpe and action on the big lake (OAHE) should start to go as water temps rise. As the lakes warm the fishing is getting warmer also. I have been part of a group of 8 guides working for the OUTPOST LODGE guiding what we always have called the WILKE GROUP of guys from around the Omaha area. 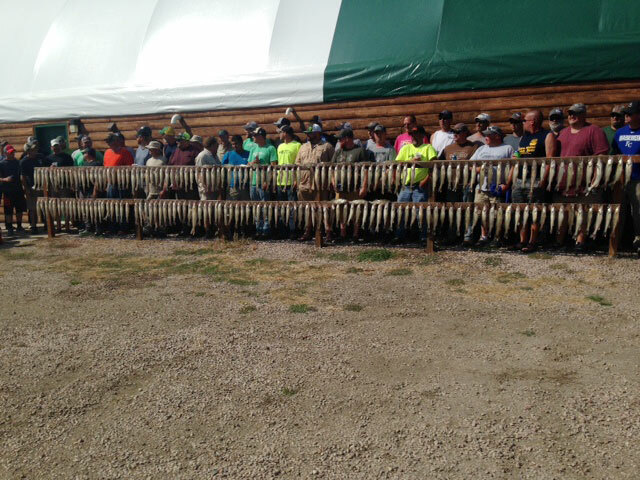 Just a great bunch of guys that make an annual visit to Pierre sponsored by their company. The weather has not favored them with colder temps and lots of rain but the bite has with most boats coming in with limits of walleye and plenty of smallmouth daily. 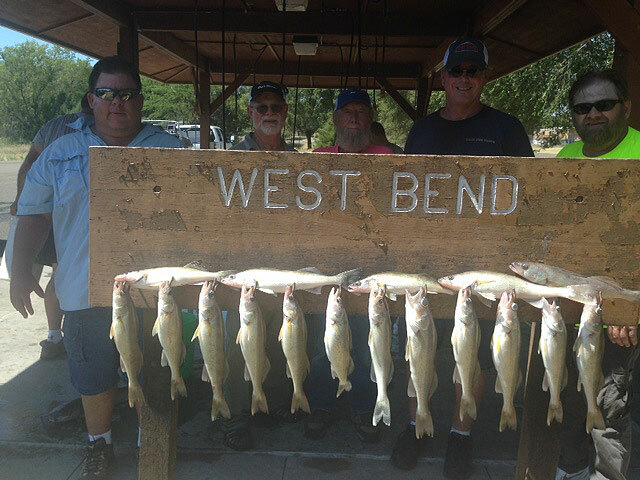 All boats fished Lake Sharpe from the Pierre area down to West Bend in mostly 10 fow or less, however some fish were caught down to 20 fow. Most fish came on minnow combos but crawlers are working now along with trolling plugs. The bite is very good but the weather took a spring time turn for the worst. It looks to be better next week. Action on Oahe is very spotty but hopefully warmer water temps will get things moving. Catfish/ smallmouth/ northern are providing the most action on the big lake right now. Had my Ida Grove friend and neighbor Stewart and Dad Glen Uken out for two days of limit fishing for walleye and some smallmouth bass. We fished Sharpe from Pierre down to West Bend using both bouncer minnow combo's and trolling plugs to put possession limits of fish in the boat. Caught all of the fish in 7 fow or less in water temps in the 50's. Just a couple of great guys and we had a great time in some real nice weather and real nice fishing. 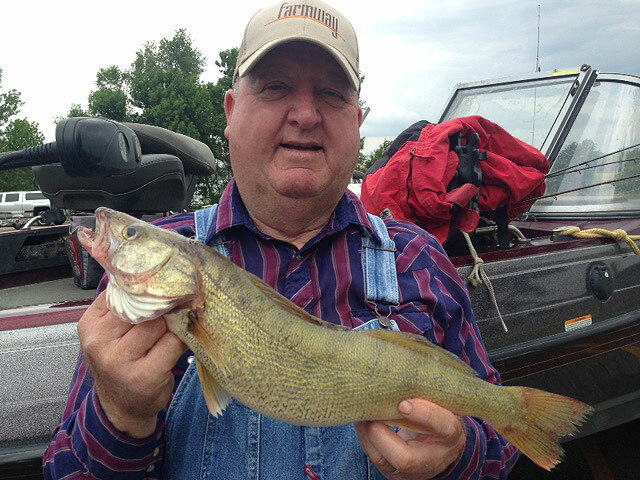 Fishing on Sharpe is going strong with most boats bringing limits of walleye/bass in daily. 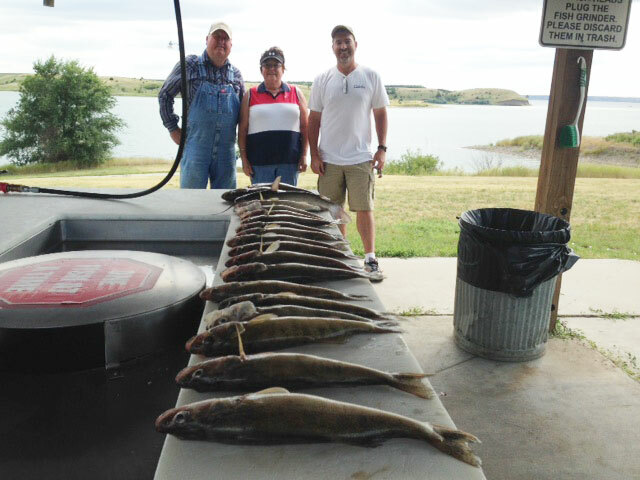 Lake Oahe is still not putting out walleye in any numbers however smallmouth/northern /catfish are being caught. I have heard of reports of walleye limits but these reports are spotty. 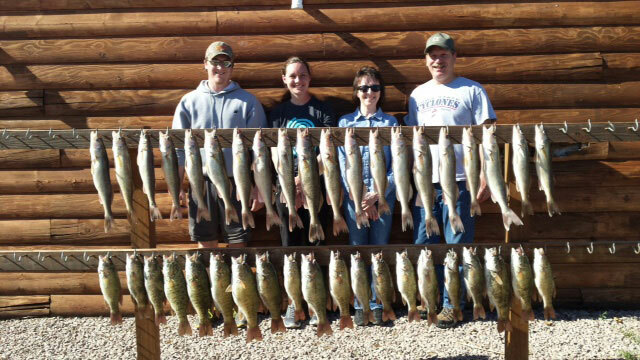 Weather is almost summer like and fishing is good around Pierre so doing a trip is not a bad idea. Just finished guiding very long time friend Jerry Fennell and his friend and college roommate Phil Wilson. Great weather and a great trip with a couple of repeat customer friend trips. They spent day one catching some catfish then we fished two days on Sharpe getting full possession limits of walleye and good numbers of smallmouth bass. Dave Spaid helped me guide their other two college roommates for their annual get together. 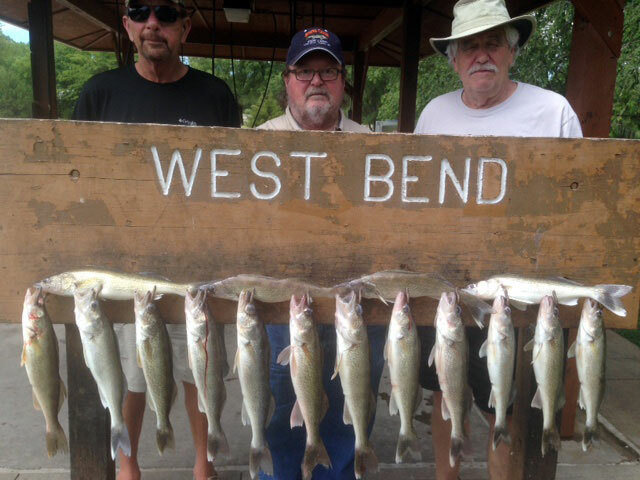 We caught the walleye and bass in 5 fow for the most part both fishing btm. bouncer/minnow combo's or pulling flicker shad plugs. Scott Van Lierre also took out some Rapid customers the Scott Bauer family, also limiting out with walleye and smallmouth. Weather is more Spring like with temperature's up to 70's and so bite should continue to keep getting even better. Oahe should start putting out some fish as temps warm. 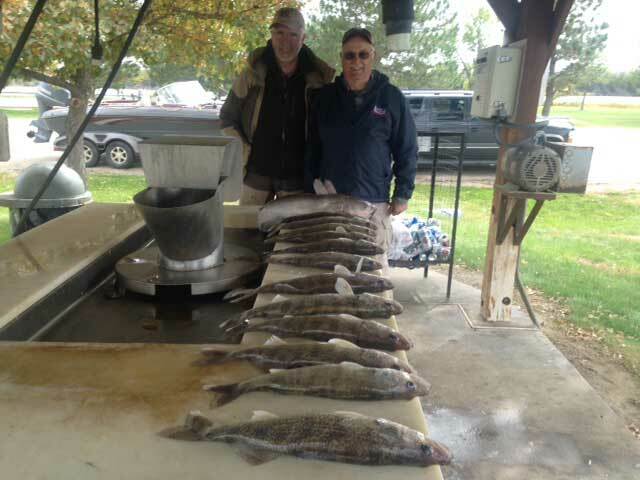 I took Dave Hafner and friend out for what turned out to be three days after they limited out on walleye and smallmouth deciding to stay and get some catfish on day three. We caught possession limits of walleye and smallmouth on Sharpe in around 5 fow on bouncer minnow or jig minnow rigs and then went to Oahe keeping 20 nice channel cats on slip bobber/smelt rigs. These twin city guys were great customers and we all had a ball. 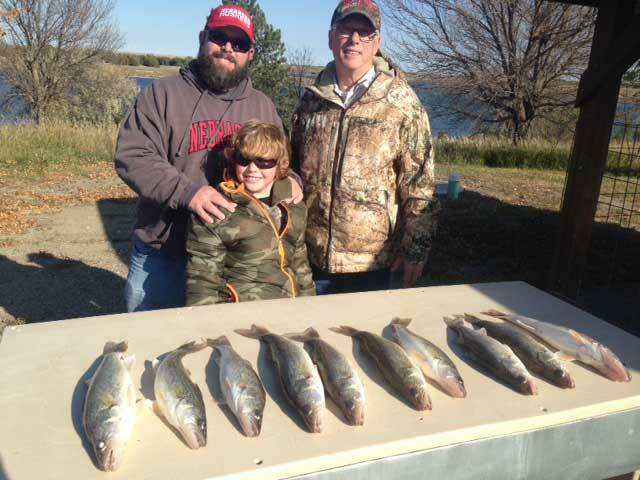 The bite continues to be limits for most boats on Sharpe from Pierre down to the bend but slower for walleye on Oahe. Here catfish/northern are the most common fish in the bag. Weather is starting to be more spring like with temps in the 60's and 70 degree range daily. Still prepare for some not so nice days this time of the year as weather is usually the biggest factor in having great trips. Boat traffic was moderate to busy on SHARPE to have the lake almost to yourself on Oahe. Water surface temps in mid 50's on Sharpe and high 40's to 50 degrees on the big lake. 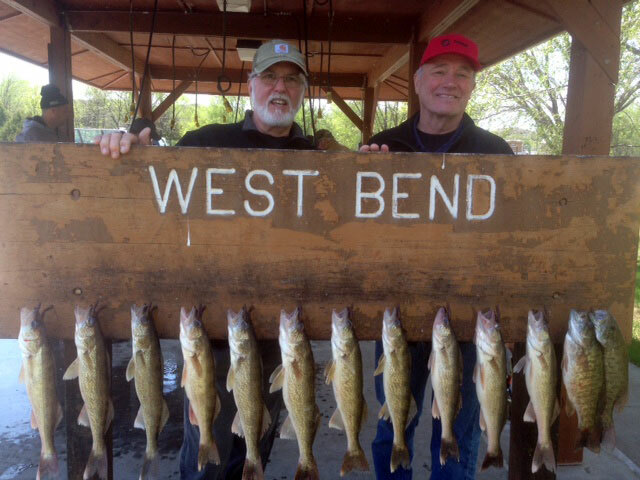 The bite for both walleye and smallmouth is going at a great spring fishing rate. Most boats fishing Sharpe from Pierre down to West Bend are doing limits daily. Water temps close to Pierre approaching 50 degrees and over 50 at the bend. Oahe still cold with action great for catfish and some big northern but slow yet for walleye. 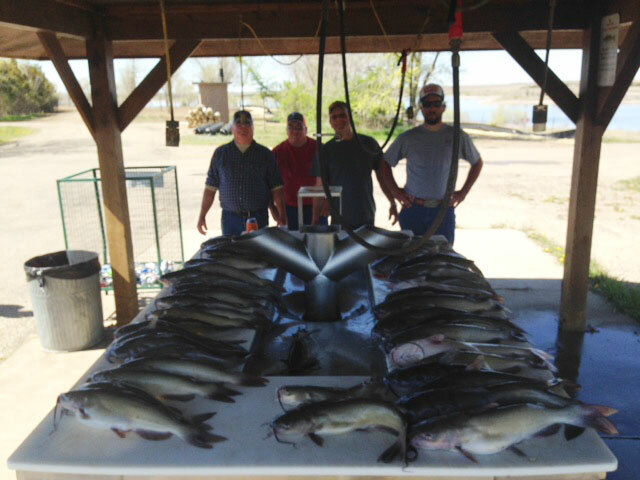 I guided the Sederlin bunch of my favorite repeat customers to full possession limits of both bass and walleye so on day three we went after catfish keeping 52 nice eaters around 3 lb. avg. 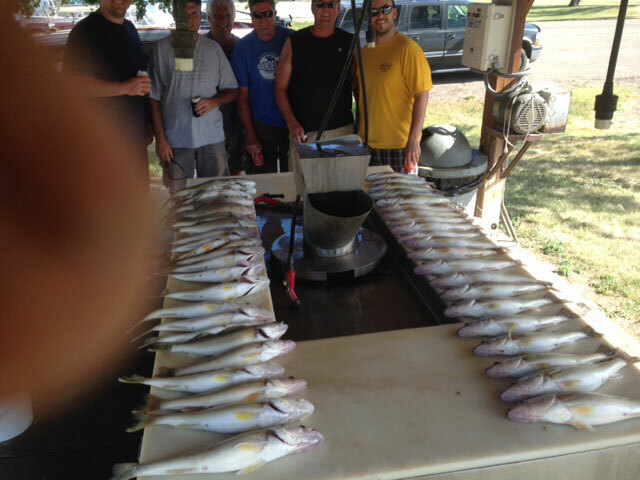 These guys know how to catch the fish and we had a blast. We caught the walleye and bas in 7fow or less on Jigs/minnows and bouncer minnows along with some pulling flicker shad plugs. Caught all the catfish in 3 fow on smelt. They went home with a lot of bags of fish. Weather is still the key here so watch that but plenty of action around Pierre. 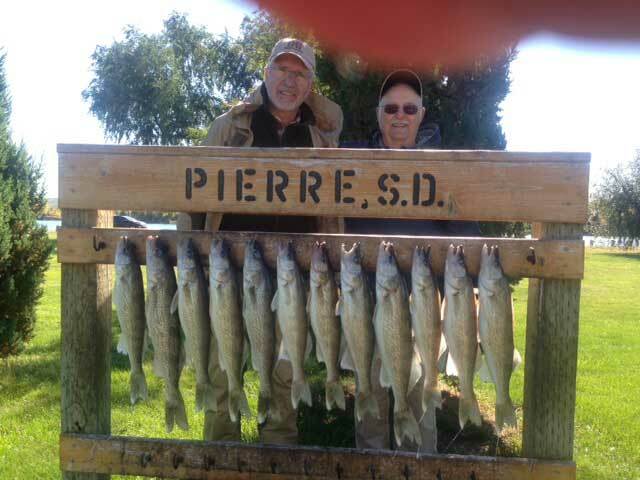 I will be doing a little talking with Ron Schara tonight at 7:15 pm for those interested in an updated report on the fishing around the Pierre SD area. 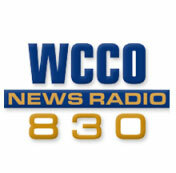 WCCO 830 AM on the dial @ 7:15 pm. Click the logo below to listen live online. I just finished guiding a new customer father/son duo for day one full limits of walleye and some bass down on Sharpe in the West Bend area. I got lucky here with as nice a couple of guys as you would want and at least for day one the weather was great and so was the bite for eating size fish. The last week has been mostly nasty weather and it sure looks like at least Monday is going to be nasty too. Father Dan Rykhus and son Dave from the Sioux Falls area were both experienced fishermen making my job easier. We pitched jigs and gulp around known spawning areas and also pulled flicker shad plugs in around six fow and caught fish both ways. 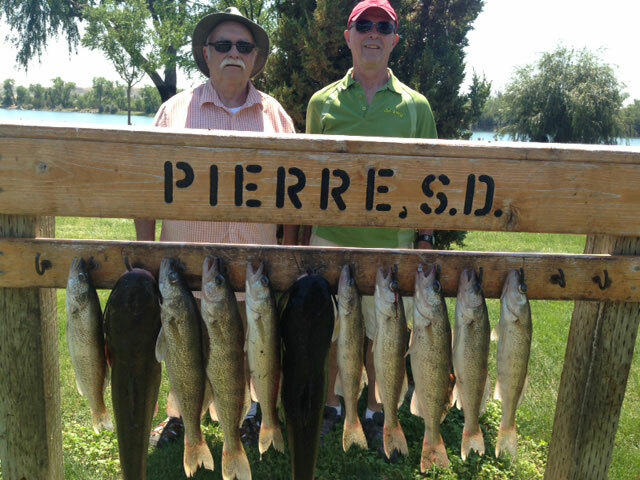 General speaking the bite is okay on Sharpe from Pierre down and Oahe still going for northern and catfish but not much on the big lake for the walleye that I know of. Water temps still cold around Pierre (40's) and right around 50 degrees at West Bend. Oahe temps are staying in the high 40's main lake but you can find 50 degree stained water in the back of creek's. It is early and weather is the key to successful trips but things should improve as we move into May. Boat traffic was down this week mostly due to some bad weather forecasts but if you are heading this way expect boat traffic to be up with improving spring weather. Well here we go again and what a great way to start the 2017 season. A beautiful week end with the weather great and one off my favorite repeat customer's Dave Petrocco of Petrocco farms and his son Dominic from over Denver way my first trip of the year. 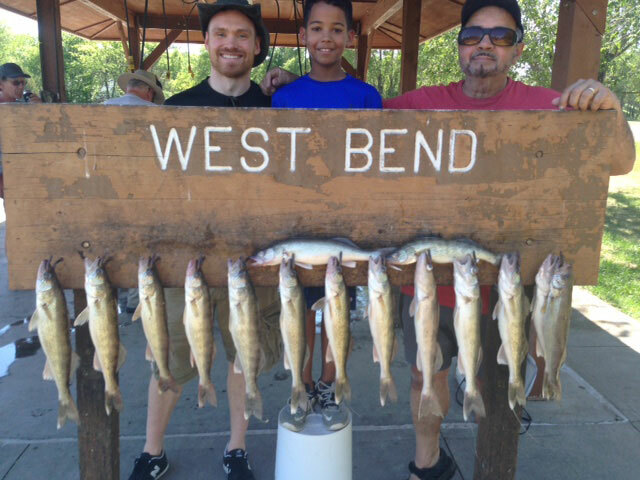 Dave's boy Dominic is well trained by his dad and caught a bunch of fish making for a great trip for him and his Dad. 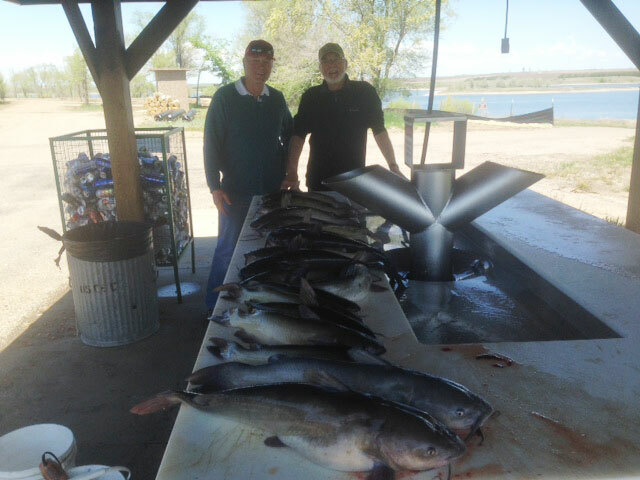 The fishing was work for them but we fished to limits of walleye and almost their limit of smallmouth bass on Sharpe and then put the boat in on Oahe for a half day of fishing for Northern and catfish. We threw back a couple of northern one around 14 lbs. and another maybe 8 lbs. and a bunch of catfish keeping five of the best eaters for their flight back to Denver. Fishing is good but not great yet on Sharpe with limits for a lot of boats on the water but some not filling. 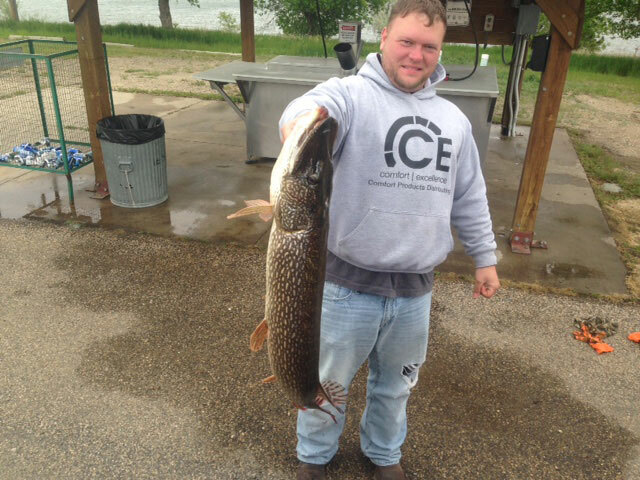 From what I heard Wille Gloe and crew won his own Northern Tournament with a catch of nine pike for ninety some pounds with the biggest fish around 18 lbs. 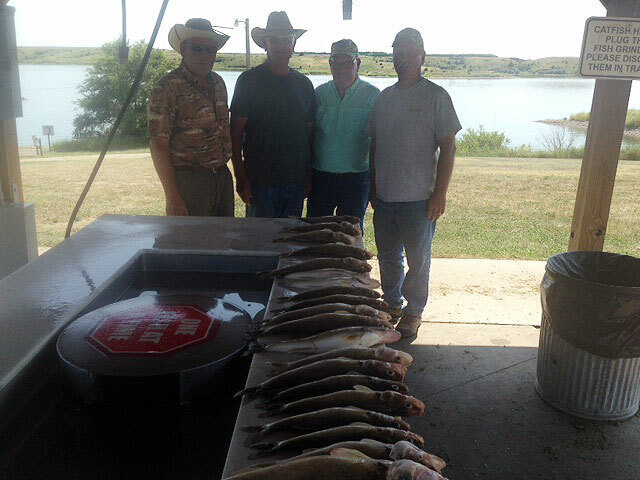 Most teams had two or three fish on Oahe in this tournament on Saturday. The bite on the big lake for walleye smallmouth etc. is early and slow yet with water temps in 40's on the main lake and in creeks up to 50 degrees. Sharpe has temps around 50 degrees now with things starting to go. The bait of choice minnows on jigs/pulling shallow plugs for walleye and smallmouth and dead smelt/herring pike sets for northern with creek chubs good also. It is great to have a sunburn and be back on the water and I will start posting reports now in a regular time frame probably around every two or three days. Weather this coming week looks not so good so watch it real close as it is always the biggest factor this time of the year. The year looks normal on Sharpe and hopefully on Oahe also but the lower end might push more boats fishing from the Cheyenne north due with the lower end of the lake spotty but we shall see as it is to early to tell. There is a lot of boats around for this early in the year so expect company at boat ramps like west bend etc. If that is a factor in fishing for you right now you can escape this by fishing Oahe but the bite is harder. I am still not on the water but decided to update my reports page with a very sad note. Karl Palmer one of the very best guides in the Pierre area made a fatal mistake trying to retrieve his boat after it broke lose from the bank in CHANTIER CREEK on Oahe and drowned. This tragedy is felt I am sure by both his entire family and also the family of guides all up and down the river that knew Karl. My condolences to all his family. He is going to be missed and remembered by all of use who knew him. A class act and a great guide and this is a reminder to all of us that spend are lives on the water that split second decisions can have life threating results. I have made several over the years that later I thought I got lucky on that one. If my boat went a drift like happened to Karl with the responsibility's of customers on the bank it is real possible, even in the cold water, and if I thought a quick dive would get it back I might have done the same thing. Rest in Peace Karl and you will be remembered. Just a quick report about ice out conditions on the lakes. Oahe is open all the way up to the 212 bridge and Sharpe is open all the way down river from Pierre. I have not been on the water so the fishing report is from other guides that have been. I will start fishing after Easter so reports will start more frequently. 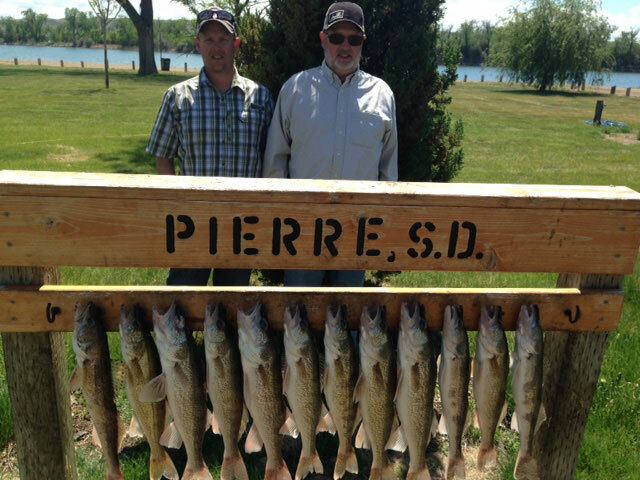 The bite around Pierre on Oahe is good for Northern in the back of creeks and bays with a lot of the fishing being done on the banks. There are boats out and pike are coming in regularly. Bait of choice is smelt on Pike sets usually two treble hooks rigged to hold smelt in two places. I have always preferred one 2/0 circle hook on steel leaders and miss very few fish on this set up. I have found it is much easier to release the fish if that is wanted. It is also easier to get out of other fish (catfish) etc. The standard pike set of two treble hooks is the most popular. Sharpe is going most days for both pre spawn walleye and some smallmouth. The next week should start the spawning run on Sharpe in full swing so catching mostly male fish will be more common and for me I think that is good. Oahe spawning is usually a little later but is right around the corner. Jigs/minnows are the bait of choice but pulling plugs is producing two so if you like the trolling you should be able to get some fresh fish for supper. Remember weather as the next month or more has many trips slowed by mother nature. It is a very good idea to check forecasts for the days you are planning a trip and be flexible if you can. If you do hit bad conditions you can save a trip this time of year by bank fishing for northern etc. and that is usually better than sitting in a cabin/motel. It is early but spring is in the air so things are almost in line for the average fisherman to head for the water. Getting the boat and tackle ready is a good way to enhance a fun first outing. Preparation at home is fun and makes for fewer unexpected issues like motor trouble, lines breaking etc. I will start with regular reports around the last week of April. 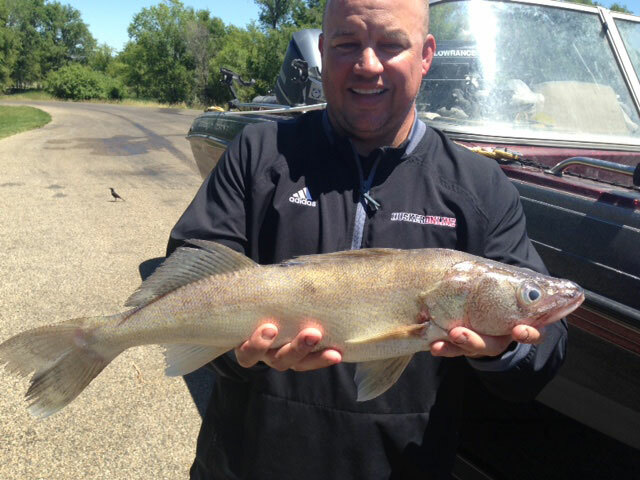 Hutch with Mr. Walleye, Gary Roach. 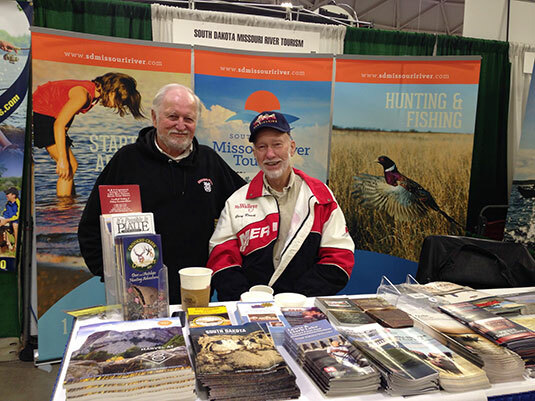 If you are attending the annual SPORTS SHOW in MINNEAPOLIS I will be in BOOTH 802 Stop by and visit or pick up information on business; resorts, guide services and all kinds of information about destination's up and down the Missouri River system. I will start with sports show information. I will be present at the Minneapolis Sports Show this next week from Thursday the 23rd until the 26th putting out information on all kinds of resorts and guide service's (including my own) from Sioux City up to the Pollack area on the Missouri River so if you are around MNPLS and are going to the show stop by The Missouri River Great Lakes booth and pick up anything that will help you plan a trip. Now on to some info about fishing around Pierre. When the weather is nice most days the boats going out are catching fish. Sharpe as always has a lot to do with the current so if they run the amount the walleye like the fish go. I have not been on the water so am relying on info from guides that are. Jigs/minnows are accounting for most of the catches. I choose not to guide this time of the year as many of the fish being caught are females full of eggs. By the 1st week of April that starts changing to mostly to males as the females get real hard to catch during the spawning run so waiting a little I think helps the fishery. This is number one a controversial statement as some biologists think a few females spawning is enough and number two you pay for a license that entitles you to a limit of 4 fish and if GFPS thinks it matters they would close the season pre spawn like Minnesota etc. does. I talked to John Cooper former head of GFPS about the early fishing several times and he told me he personally limits his boat to two female pre spawn fish and hopefully get the rest in males or practices catch and release. I have adopted that policy myself but it is very hard to charge money and then tell the customers they have to throw any females over two back so I just wait until the spawn gets in full swing (Usually mid April) and fish for the males as they are usually the ones biting. With warm spring days going sometimes early it is real hard to stay off the water and most anglers like me are wanting to catch some supper so maybe a selective harvest like Coop suggests might be a way to create more eggs hence better spawns. I am not trying to stir up any negative thoughts about early pre spawn fishing but I am passing catch and release thinking on the females full of eggs as much as possible. If you are headed to Pierre this time of year remember to keep your eyes to the sky as weather is always a real big factor in the early spring fishing. See you in MNLPS if you are going to the show and want to visit. I will start with every three day reports as soon as I get on the water probably around mid April. UPDATE For anyone coming to the show or looking for me I will be at the Missouri River Tourism Booth and that is booth 1124. Hope to see all those that need some info about the river from Sioux City to the North Dakota border. Show goes Thurs night Friday Sat Sunday. I will be at the show this coming week but this year I will be at the SOUTH DAKOTA MISSIOURI RIVER BOOTH so if you are coming to the show (Feb. 23rd 24th 25th and 26th) stop by and see me. Will be handing out information about place's and services from Sioux City to the North Dakota border so if you are planning a trip anywhere up and down the river should be able to find something for you including my guide service. Stop by and visit about fishing and hunting or just vacation trips. Unfortunately I am not going to be able to attend the Back Hills Show due to an illness in my family. This is a great show and I hate to miss it but circumstance's dictate missing it. If you were planning to come by and see me just give me a call or send me an e mail. 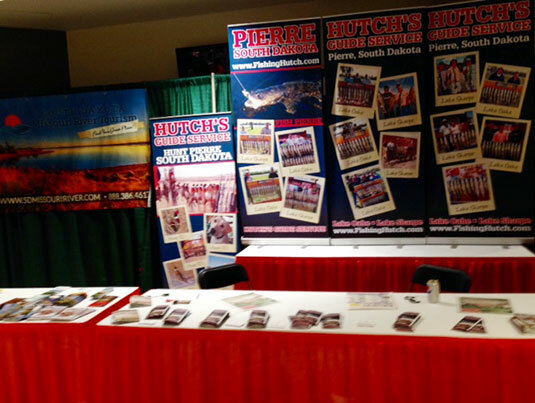 Council Bluffs booth is up and running, stop by if you are in the area! I will have my booth at THE COUNCIL BLUFFS RIVER CITY FISH/HUNT SPORTS SHOW starting January 20th and then the 21st and 22nd. Along with my booth I will do seminars on fishing the Missouri river system specifically targeting LAKES OAHE /SHARPE for all of the species that swim there. 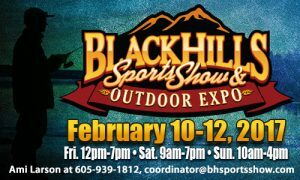 If you are in the area stop by my booth to either book a trip or just talk fishing. This has turned out to be one of my favorite shows with lots of exhibitor's and many other hunt, fish, etc. speaker's. For show hours and seminar speakers/times and other info you may go to www.rivercityexpo.com. Free parking at this show and general admission nine dollars or 15 and under three dollars so it is real family friendly. Hope to see you there.